St. Thomas does not have a Varsity Softball team and we have not been able to find a replacement so there is no Varsity Softball game for this Friday, 4/19 as originally listed on the schedule. Add to your schedules Varsity Baseball home vs. United on Thursday, 4/18 at 5:30pm. Today's cancelled JV and Varsity softball games vs. GlenOak will be made up on 4/29. Today's JV Baseball game at GlenOak is cancelled. AMS Track Changes: **Monday, May 6th meet at Minerva is CANCELLED. **Wednesday, April 24th at Carrollton has now changed to AT MINERVA competing against Minerva and Carrollton. Today's Varsity Softball game vs. GlenOak has been cancelled. JV softball today vs. GlenOak has been cancelled. Parents! 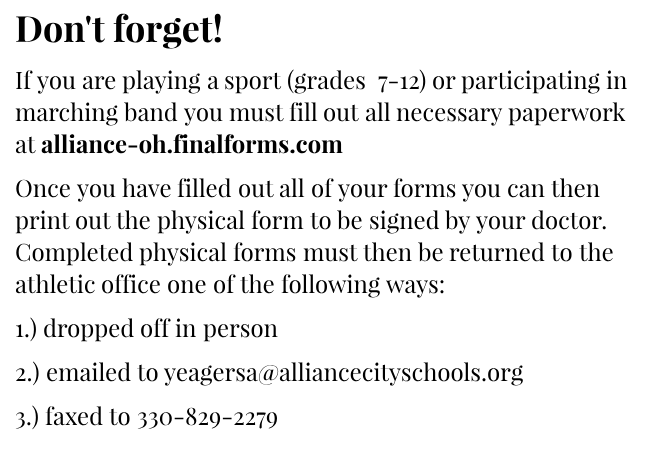 Don't forget... complete 2019-20 paperwork at alliance-oh.finalforms.com by April 30th for a FREE sports physical for your child on May 16th. Questions or Problems? Call the Athletic Office at 330.821.3972. Varsity Softball will now also play Aurora tomorrow at 2pm at Field. The JV Softball doubleheader @ Nordonia is continuing as previously scheduled. They will play Field at 11am and Nordonia at 1pm. Varsity Softball's doubleheader @ Field has changed. They will play only one game at noon against Field. Varsity Baseball @ Southeast today has been cancelled. Boys Track practice (except Distance!) is cancelled today. 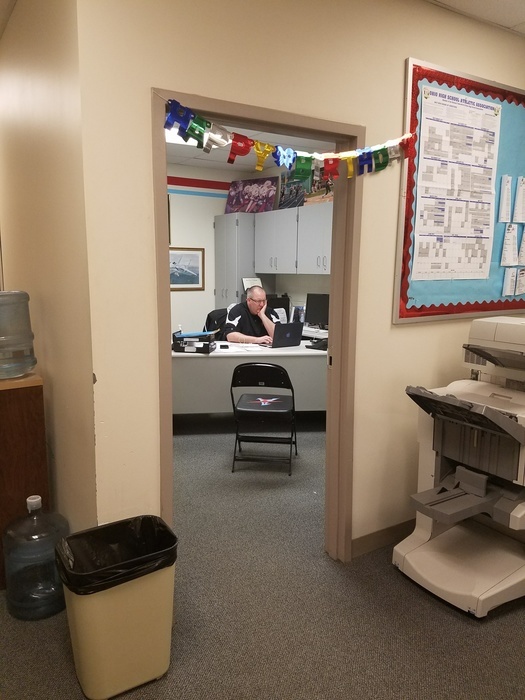 Distance should report to Coach Bobola's office at the normal time. Bus leaves tomorrow at 7am for Big Ox Invite. The JV Baseball game at Brunswick for tonight has been cancelled. There is no replacement. JV Softball vs. GlenOak on 4/15 at 5pm at Alliance (Early's Hill) has been added to the schedule. Varsity Softball against St. Thomas (4/12 & 4/19) have been cancelled and will not be rescheduled due to no STA team. Varsity Softball only has added a game and will play GlenOak on Monday, 4/15 at 5pm at AHS. Parents! Don't forget... complete 19-20 paperwork at alliance-oh.finalforms.com by April 30th for a free sports physical for your child on May 16th. Questions? Call the Athletic Office at 330.821.3972. Today's JV softball games have been cancelled. JV baseball has added a game for tomorrow, Saturday, 4/6 at noon vs. Hoban. Varsity Softball and JV Baseball are STILL ON for tonight! JV Baseball @ South Range for tomorrow has been cancelled. Today's JV Softball game vs. Northwest has been cancelled. The JV Baseball team has added a game on Saturday, 4/6 at 11am AT South Range. 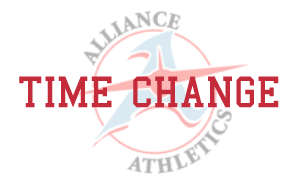 Softball Changes - The JV & Varsity Softball games originally scheduled for 4/18 at Minerva will now be played at Alliance. The JV Baseball team has added a game vs. Columbiana tomorrow, 4/5 at 5pm to be played at AHS. Baseball Fans: If you plan on going to the Varsity Baseball game at Massillon next week please note that they do charge admission. It is $3 per person. 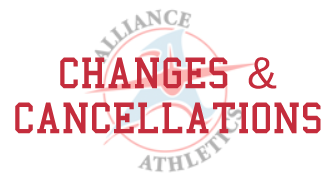 *Softball Changes* The JV & Varsity Softball games originally scheduled for 4/18 at Minerva will now be played at Alliance. 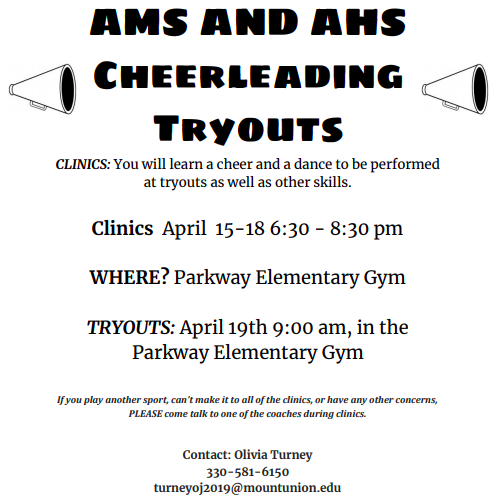 AHS & AMS Cheer tryout information can be found here! ALERT! 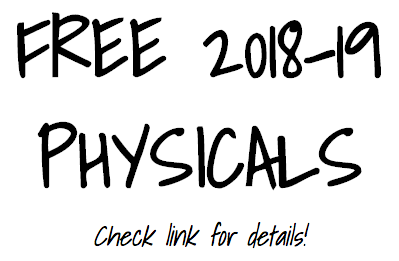 Free physicals and 2019-20 Athletic Paperwork Info! DUE BY 4-30-19! Success and Digital Academy student parents will need to contact the Athletic Office once their account has been created to be added to a team. The boys tennis match at West Branch originally scheduled for 4/10 has been moved to 4/3. It will still be at West Branch. SB changes tonight - now Varsity will be going to Minerva, JV is cancelled and will be made-up on 4/22. *Softball Changes* Today's Varsity Softball game will be played AT Minerva at 5pm. Today's JV Softball game is cancelled and will be made up AT Minerva on 4/22 at 5pm. *Softball Changes* Today's Varsity SB game will be played AT Minerva at 5pm. Today's JV SB game is cancelled and will be made up AT Minerva on 4/22 at 5pm. The JV & Varsity SB games originally scheduled for 4/18 at Minerva will now be played at Alliance. 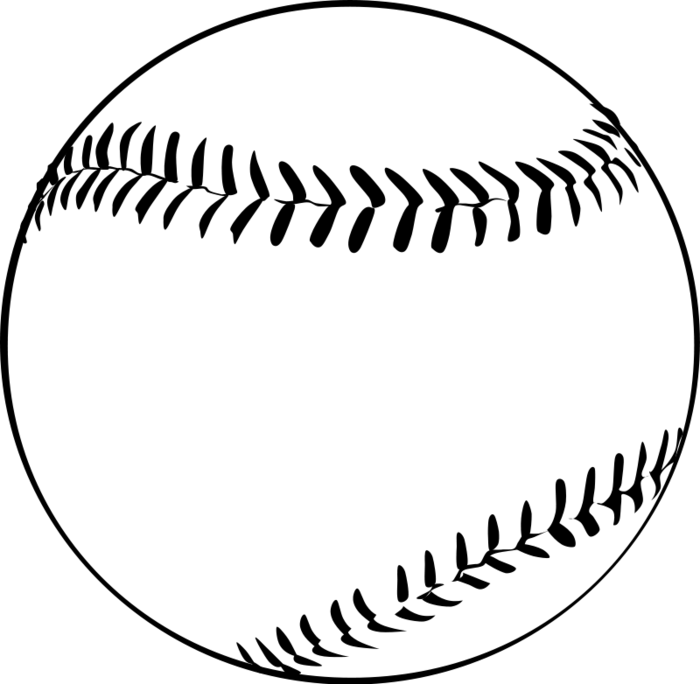 The Varsity Baseball team has added a game this Thursday, 3/28 at Ashtabula Lakeside at noon. The Alliance Police Reserves are hosting a Rigatoni Dinner & Auction tomorrow, 3/24 from 12pm-5pm at the Christopher Columbus Hall for an $8 donation. Carryout is available. They are always helping at our events so please support them! Reminder: The Spring Sports season officially starts tomorrow. All changes will be posted here. 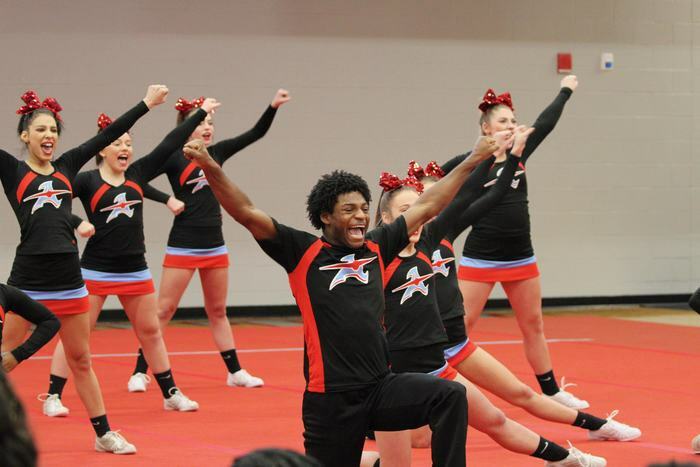 Schedules have been posted on our website if you haven't received a copy from your coach yet. Tomorrow's Varsity baseball game vs. St. Thomas has been pushed back to a 1pm start. The AHS Track Meet @ West Branch originally scheduled for Tuesday, 3/26 has been moved to Thursday, 3/28 still at 4:30pm. Reminder: AHS Awards Night is tomorrow, 3/13 in the AHS Auditorium. 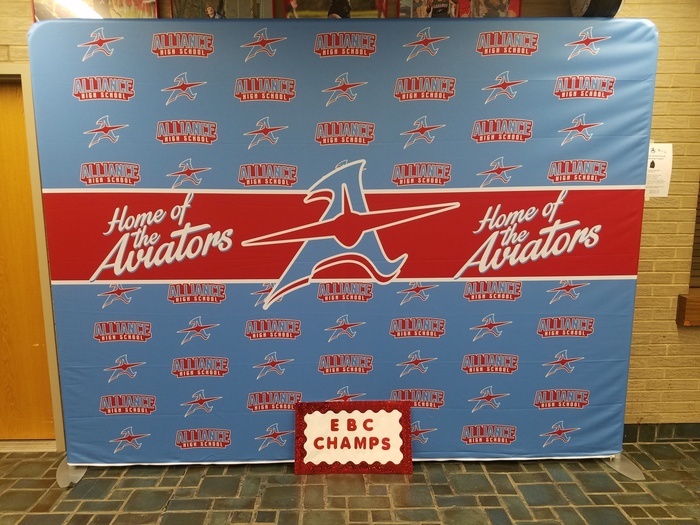 EBC Scholar Athletes and Seniors should report at 6pm for pictures. The program begins promptly at 6:30pm. The JV/Varsity Softball games vs Minerva on 3/26 have been moved to Monday 4/1. Good luck to Alliance's own Nick Oldfield in the Canton Ballet's Touchdowns and Tutus competition on 3/9. Use "game" at cantonballet.com for $5 off student tickets until 3/2. 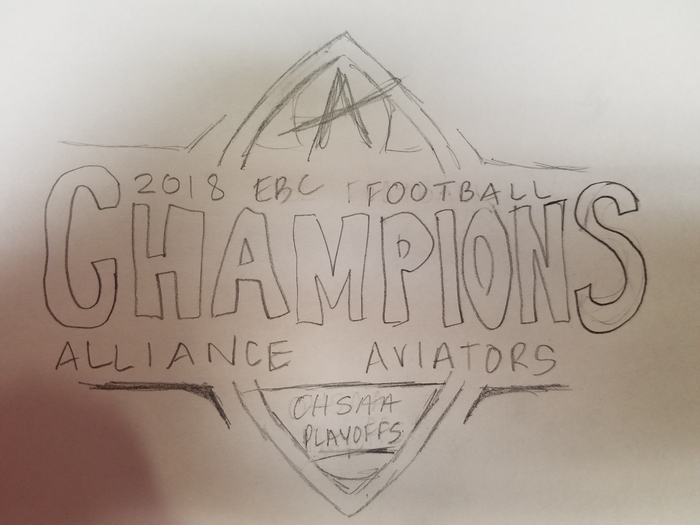 Another week, another EBC Championship for Alliance! This time the Boys Bowling Team has earned an EBC Championship to go along with their Stark County-American Division title. EBC Champion Shirt orders are due by 2pm on Mon, Feb 25th. EBC Basketball Shirts are in! If you ordered one you can pick it up today between 1pm & 3pm. If you missed the first order we will be doing a 2nd order as long as we get 10 total pieces ordered. Those orders will be due by 2pm on 2/19. Tonight's wrestling match at Girard may start early around 6:30pm due to an expected low number of middle school matches. If you plan on trying out for a Spring sport make sure all of your forms are completed and e-signed on alliance-oh.finalforms.com and your physical is turned in to the Athletic Office. If you have questions call 821.3972! Tonight's Varsity girls basketball game will start at approximately 7:15pm. The Varsity girls basketball game at Marlington will be made up on Monday, 2/4 at 7:30pm still at Marlington. Tonight's AMS & AHS wrestling match with Carrollton is continuing as previously scheduled. 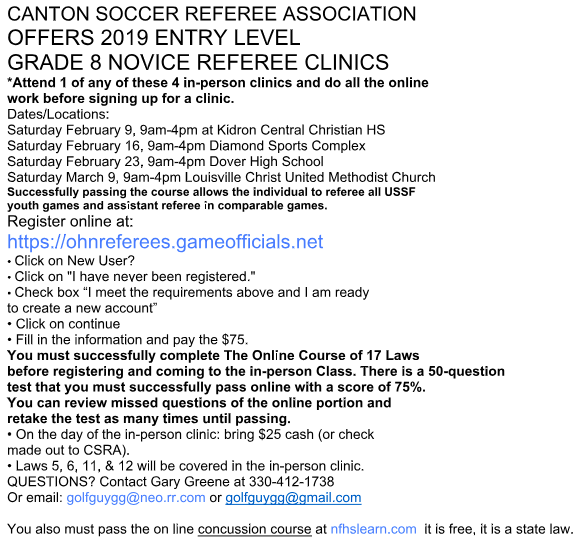 Interested in becoming a soccer official? Check this info out! Tomorrow's (1/30) AMS basketball games have been cancelled and rescheduled for 2/6. Tomorrow's (1/30) Varsity Girls Basketball game at Marlington has been cancelled. A make-up is TBD. Tomorrow's (1/30) Bowling match at Minerva has been moved to Wednesday, February 20th. If you are headed to the boys bball games tonight at Perry please note JV starts @6pm, followed by Varsity @7:30pm. It has always been listed on the schedule like this but we just want to make sure you're aware! The Salem tournament for AMS Wrestling will be made up on Sunday 2/3. Tonight's AMS basketball games have been cancelled and will not be made up. The girls basketball game at Sandy Valley on 2/13 has ben moved up to 5:30pm. Tonight's Bowling match at United is cancelled. Tonight's Boys Basketball games vs. Salem are still on. Tomorrow's Middle School wrestling tournament at Salem has been cancelled. Tomorrow's Bowling Invite at Dover has been cancelled. Any make-up is TBD. 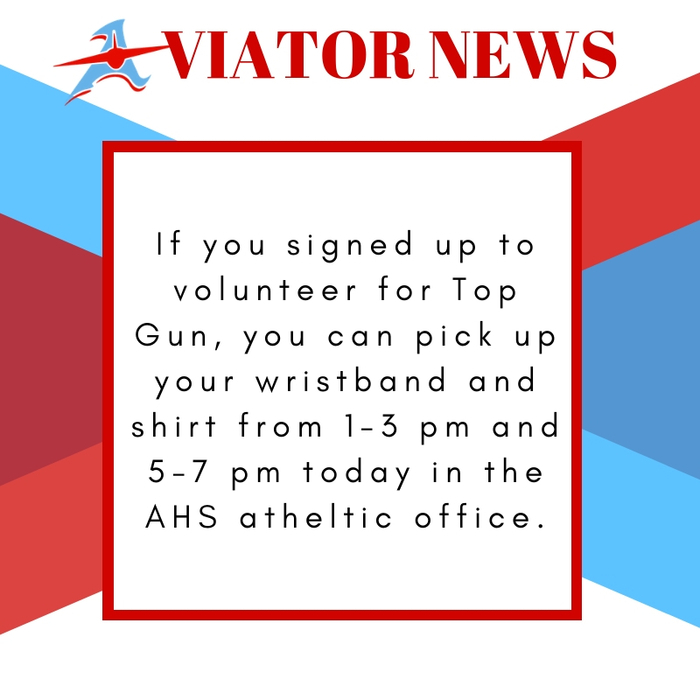 Top Gun Update! WE'RE STILL WRESTLING! Finals tomorrow have been moved up to 3pm though! 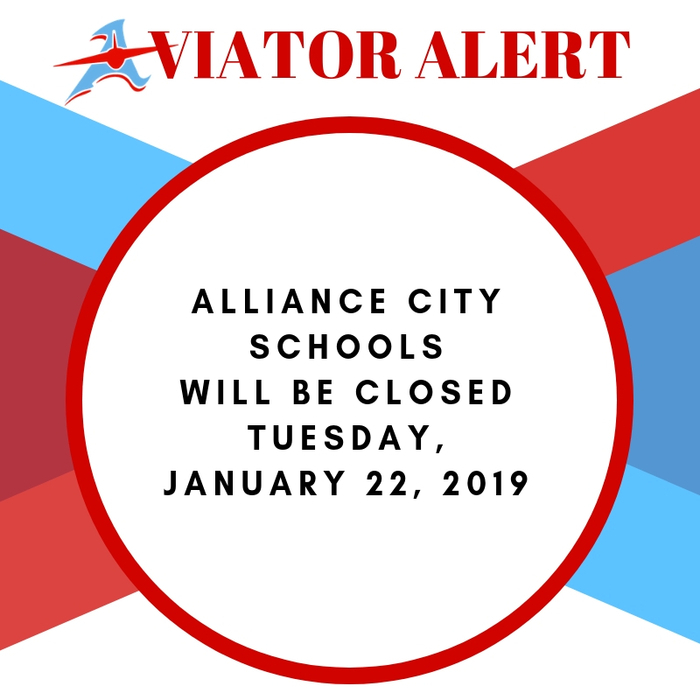 Today's cancelled Varsity girls basketball game vs. Salem will be made up next week, Wednesday, Jan. 23rd at 7pm at Alliance. Tonight's Bowling match at Canton McKinley is cancelled. All athletic events for this evening have now been cancelled. Make-ups will be announced as they become available. Today's Varsity Girls Basketball game vs. Salem has been cancelled. A make-up is TBD. Tonight’s Boys and Girls Middle School Basketball games vs Massillon are cancelled due to school being cancelled. The Bowling match with Jackson originally scheduled for 2/8 has been moved to 2/13. After school running for anyone interested in running HS track starts this Monday, 1/7 at 2:45pm in the lobby. They will run Mondays/Wednesdays/Thursdays. Bring clothes and shoes to run inside! The boys and girls bowling match against Marlington for 1/15 will now be 1/14 at the Elks starting at 3:30pm. The Girls Varsity Basketball Akron-Springfield game will be made up on January 3rd. The game will still be at Springfield at 7pm. The Girls Varsity Basketball game scheduled for this Monday at Akron Springfield has been cancelled. A make-up will be announced at a later date. The Girls Varsity Basketball game originally scheduled for 12/12 vs. East Liverpool has been moved to 12/28 at 1pm still at Alliance. 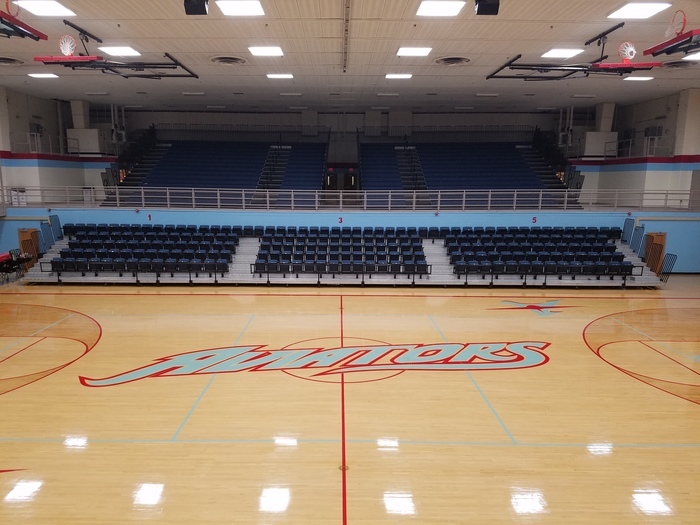 This Saturday's Varsity Girls Basketball game at Salem will now start at approximately 2pm following their JV game against Western Reserve at 12:30pm. Boys Basketball Fans: Please note that this year all JV games start at 5:30pm and Varsity at 7pm. This is earlier than in the past!! Do you need an excuse to have Chipotle for dinner? 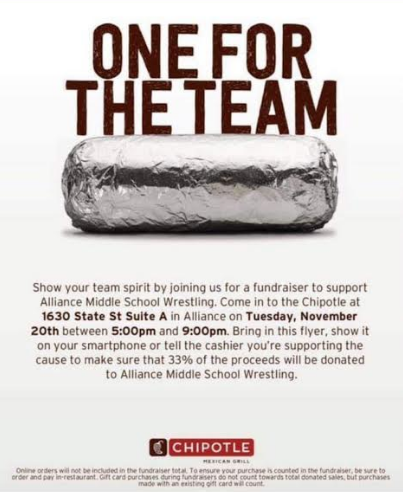 Go tonight between 5pm-9pm and show this flyer or let them know you're there to support the AMS wrestling team. The AMS wrestlers thank you! 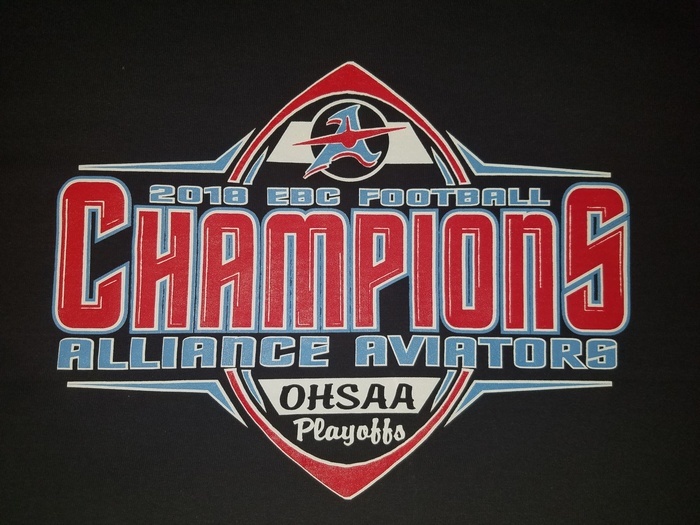 A 2nd order of EBC Champion/OHSAA Playoff shirts will be ordered if we collect a minimum of 12 orders. If you missed out the first time now is your chance. 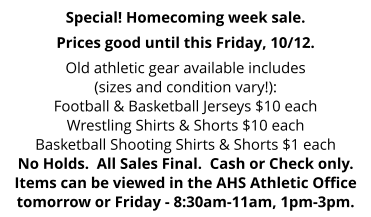 Orders will be due directly to the AHS Athletic Office by Friday, November 9th at noon. Order link to follow. Not only does Noah play in the game he will sell you tickets to it also! Playoff tickets on sale TODAY till 7pm and tomorrow 8:30am-noon only! $8 at AHS, $9 if you wait till you get to the game. The HANGAR is also open tonight 3pm-7pm. 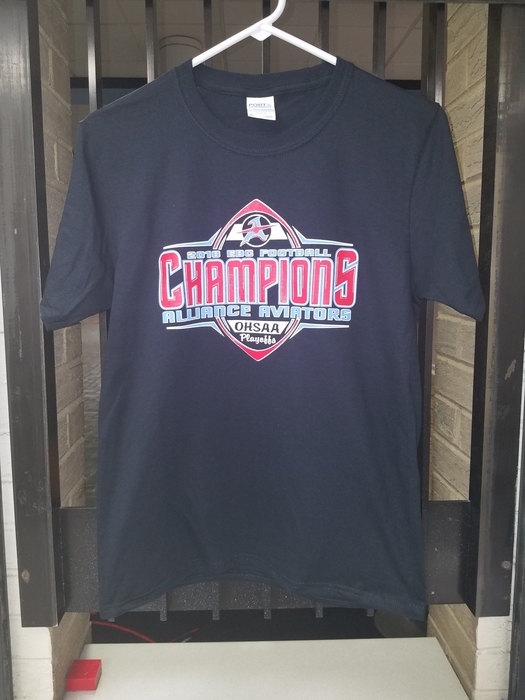 EBC Champion shirts are in and can be picked up today between 1pm and 7pm from the Ticket Office Window!!!! If you missed Youth Wrestling (grades 1-6) sign-ups you can still sign up next week/the first week of practices on Mon 11/5 or Wed 11/7. Practice begins at AHS at 6pm, staff will be on site at 5:30pm. Please enter through door #43. Questions call Craig Shaw at 304-374-1678. REMINDER!!! If you plan on playing a winter or spring sport make sure you get all paperwork completed and e-signed at alliance-oh.finalforms.com and turn your physical in to the athletic office! Call 330.821.3972 with questions! No paperwork/physical done = no practice! 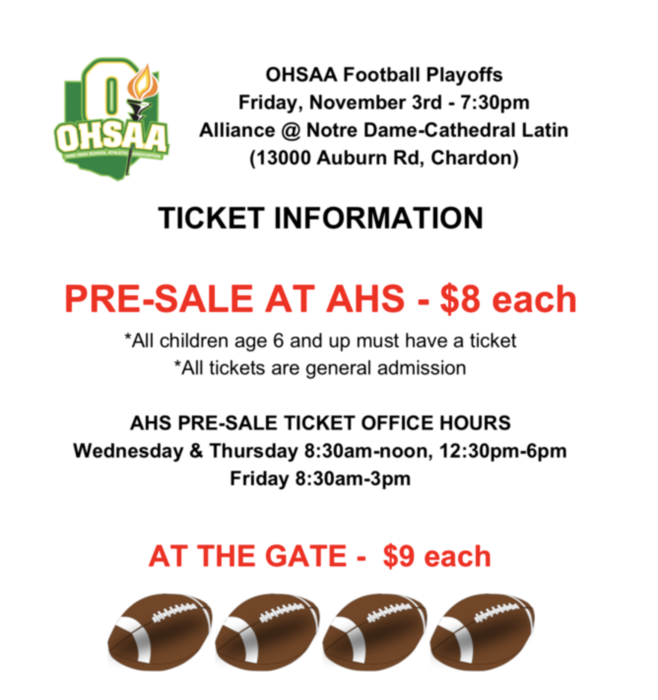 Football Playoff Ticket Information Here! There will be a HS student spirit bus leaving at 4:45pm from the front parking lot on Friday to go to the FB game. The cost is $10 and includes your ticket to the game!! Please sign up in the athletic office before Thursday at 3pm. You must pay when you sign up. **Reminder: EBC Champion Shirt order forms must be turned in by NOON TODAY. 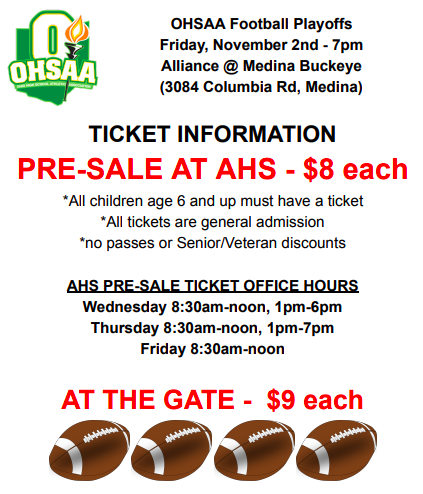 ** OHSAA playoff/ticket/spirit bus information for this Friday will be posted as it becomes available. **Reminder: EBC Champion Shirt order forms must be turned in by NOON Monday. ** OHSAA playoff/ticket/spirit bus information for this Friday will be posted as it becomes available. 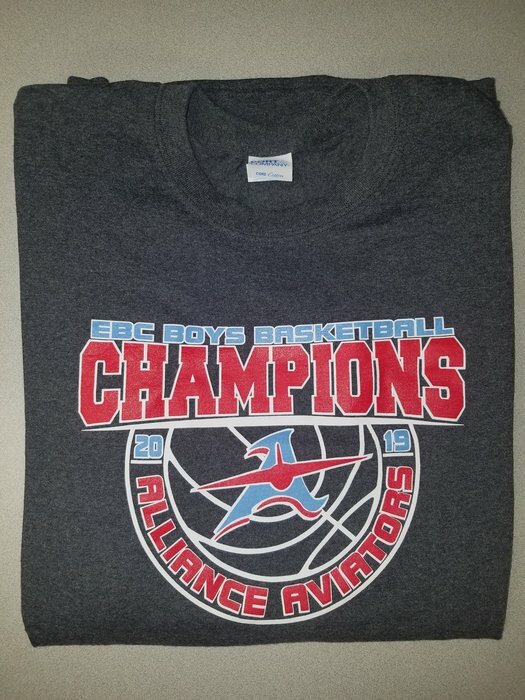 The AHS Athletic Office will be open 4pm-6pm tomorrow and 8:30am-noon on Monday for anyone who would like to turn in their EBC Championship Shirt Order Form - form can be found in previous tweet or picked up at the Athletic Office! Congratulations to the 2018 Football team for winning the 2018 EBC Championship!!!! EBC Championship shirts will be available via PRE-ORDER ONLY. 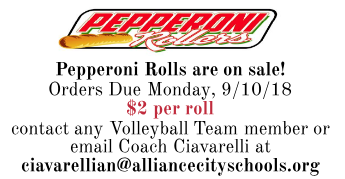 All order forms and payment must be received by the AHS Athletic Office by noon on Monday, October 29th. 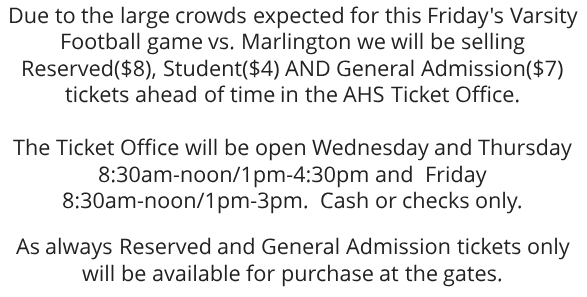 Due to the large crowds expected for this Friday's Varsity Football game vs. Marlington we will be selling Reserved($8), Student($4) AND General Admission($7) tickets ahead of time in the AHS Ticket Office. See image for ticket office hours. 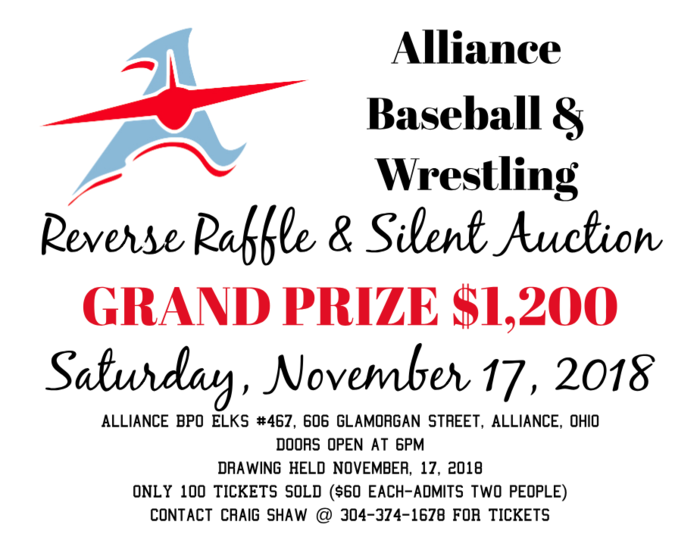 Click on this image for info about the Baseball/Wrestling Reverse Raffle in November!! The Freshman Football game vs. Minerva on Thursday, October 18th has been cancelled. There is no replacement scheduled. Marching Band, Football, Cross Country & Cheer Seniors! Have you filled out your Google Form to be introduced on 10/26? 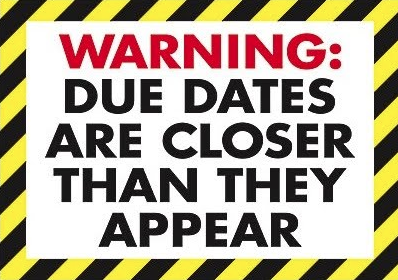 Check your email - it is due by Wednesday! The people needed list is posted outside the athletic office. This Saturday's JV football game at Carrollton has been cancelled. There is no replacement game scheduled in it's place. Need a Halloween costume? Want to #RepthatA? Old athletic gear on sale now - special prices this week only! See image for details! The girls soccer game for tonight is cancelled. The boys game and senior night is still on. The girls tennis match scheduled for 10/9 vs. West Branch will now be 10/10 at 4pm at Silver Park. The Varsity Girls Soccer team will play New Middletown Springfield on Thursday, October 4th at 5pm at Rockhill before the Boys Varsity Soccer game vs. Akron Kenmore/Garfield. REMINDER!!! If you plan on playing a winter or spring sport make sure you get all paperwork completed and e-signed at alliance-oh.finalforms.com and turn your physical in to the athletic office! Call 330.821.3972 with questions! FYI for tonight's boys soccer games at Minerva. The JV Game at 5pm is at Minerva MS Soccer Field at 600 E. Line St. The Varsity Game at 7pm is at Minerva HS Hines Stadium at 501 Almeda Ave. Boys Soccer Fans: Please enter via the front gate only at Mount Union, tickets will be sold. Boys Golf will be making up their golf match with Louisville tonight at 4pm at Sleepy Hollow. Tonight's Varsity Boys Soccer game vs. Canton McKinley has been moved to Mount Union's Football Stadium still with at 7pm start. The JV match has been cancelled. Senior Night will now be next Thursday, 10/4 before the Kenmore/Garfield game. The Boys Golf match for today @ Louisville has been cancelled. A make-up is TBD. Tonight - girls soccer - VARSITY ONLY will play vs. Akron Ellet at Mt. Union's Football Stadium beginning at approximately 7pm. Please enter via the front gate only, tickets will be sold. JV has been cancelled. Tonight's Middle School (8th grade) Football Game vs. Canton South has been moved to the AHS Field (Len Dawson) and will still be at 5pm. 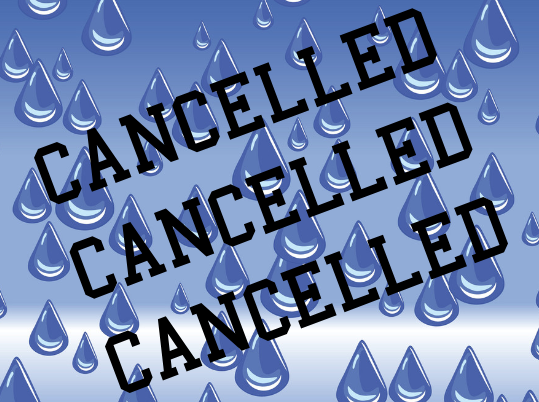 Today's cancelled girls tennis match will be made-up on Tuesday, Oct. 9th at 4pm at Silver Park. The girls tennis match for today vs. West Branch has been cancelled. A make-up is TBD. 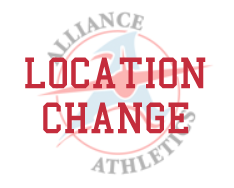 LOCATION CHANGE: Tonight's boys soccer game vs. Carrollton has been moved to the Marlington High School Football Stadium. The game will still start at 7pm. ADDITION: Girls Soccer will play Akron Ellet this Wednesday, 9/26. 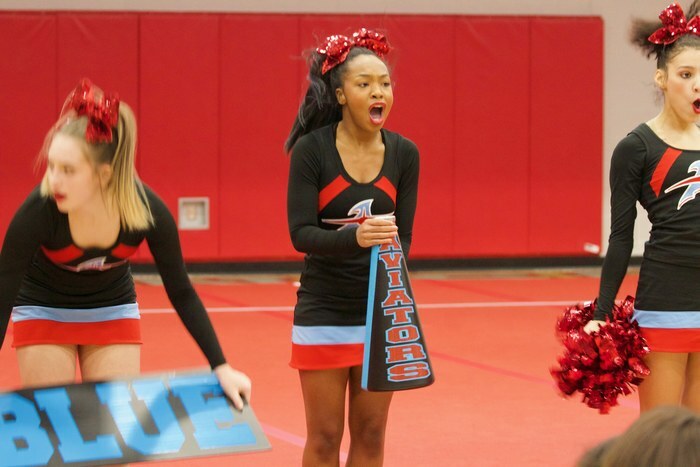 JV at 5pm, Varsity at 7pm both at Rockhill. On 10/8 we will have a JV girls soccer match vs. West Branch at 5pm before the Varsity match vs. West Branch at 7pm. Both games will be at Rockhill. Tonight there will only be a girls Varsity soccer game - no JV. For only this week's Varsity Football away game (@Poland) we will be selling student AND adult tickets in the AHS ticket office. Pre-Sale Tickets at AHS Adult - $6, Student - $4 All Tickets at the Gate are $7. The girls soccer games tonight vs. Firestone have been cancelled. A make-up date is TBD. 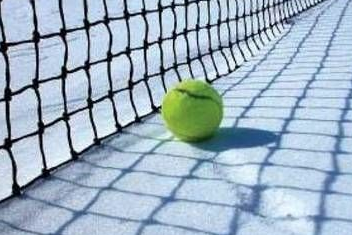 Today's Girls Tennis match vs. Crestwood has been cancelled and will be made-up on Monday. Oct. 1st. The girls golf match tonight vs. Marlington has been cancelled. A make-up is TBD. The freshman football game this Thursday will be against Barberton instead of Poland. 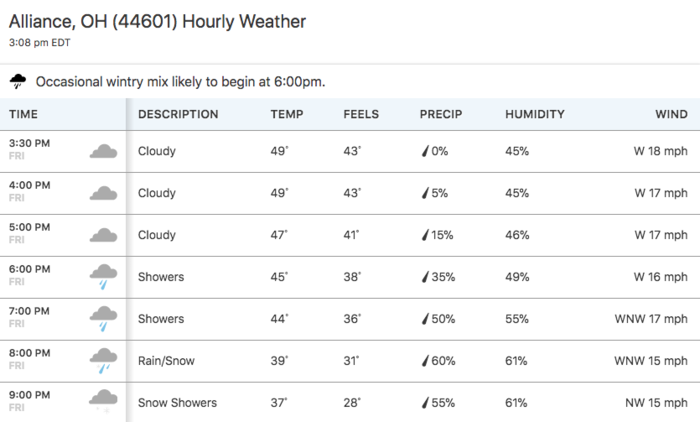 The game will still be at home, still at 5pm. The girls tennis match against Salem on 9/22 at 10am will now be at Alliance. Tonight's girls tennis match in Alliance has been moved to Salem due to a scheduling conflict and will start late. The girls tennis match yesterday at Massillon was postponed until Thursday, 9/20. The daddy-daughter event at the girls soccer game for tonight has been moved to next Monday, 9/17 vs. Firestone. The BWW fundraiser is still going on all day. Tonight's girls soccer games vs. Tallmadge have been cancelled. A make-up is TBD. The girls golf match @ West Branch today has been cancelled. A make-up is TBD. Hungry?? 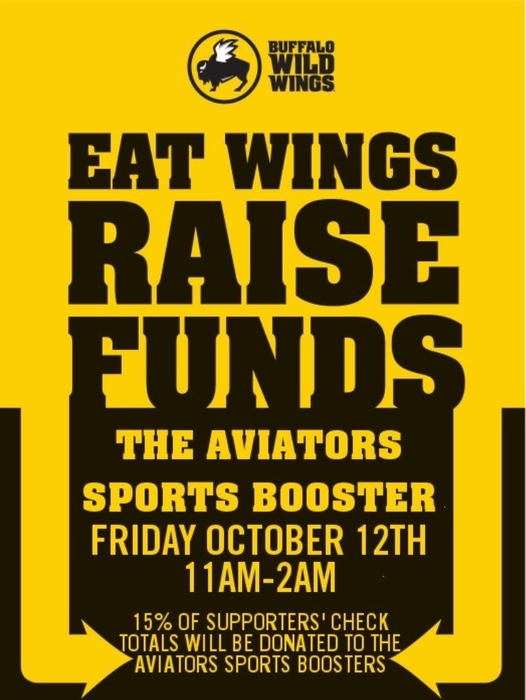 Stop by Buffalo Wild Wings today! 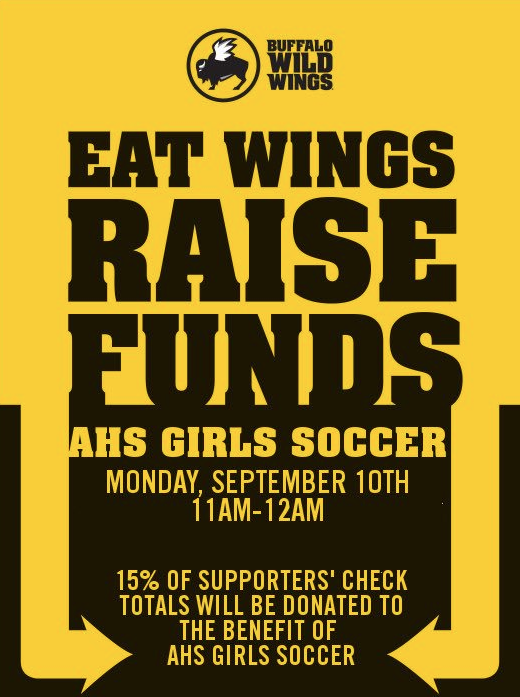 Buy some food and show this picture to support the Girls Soccer team. Students! 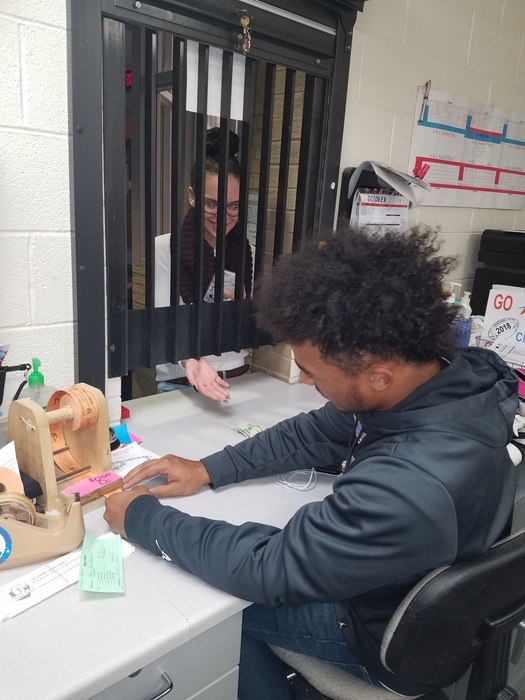 The ticket office is open tomorrow 8:30am-11am and 1pm-3pm for you to buy $4 student tickets for the Varsity Football game. If you don't pre-purchase you will have to buy a $7 general admission ticket at the gate to get in. No student tickets will be sold at the gate!! The JV Football game at Canton South on 9/29 has been cancelled. We will be going to Streetsboro instead that day with a 10am kickoff. Today's AMS golf match vs. Carrollton has been cancelled. A make-up is TBD. The girls tennis match tomorrow 9/5 @ West Branch has been moved to the Salem Racquet Club. The AMS football game, girls golf and girls tennis matches have all been cancelled for tonight. The AMS football game is also cancelled tomorrow. 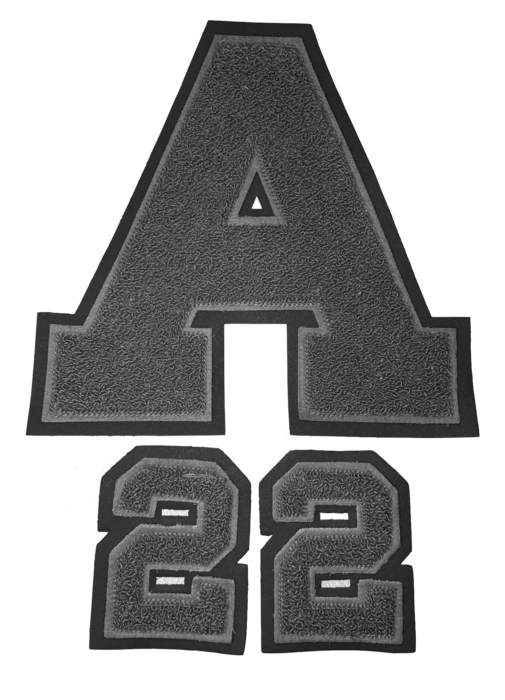 The 1st meeting of the Aviator Sports Boosters for 2018-19 will be Monday, September 10th at 7PM at AHS in room 235. 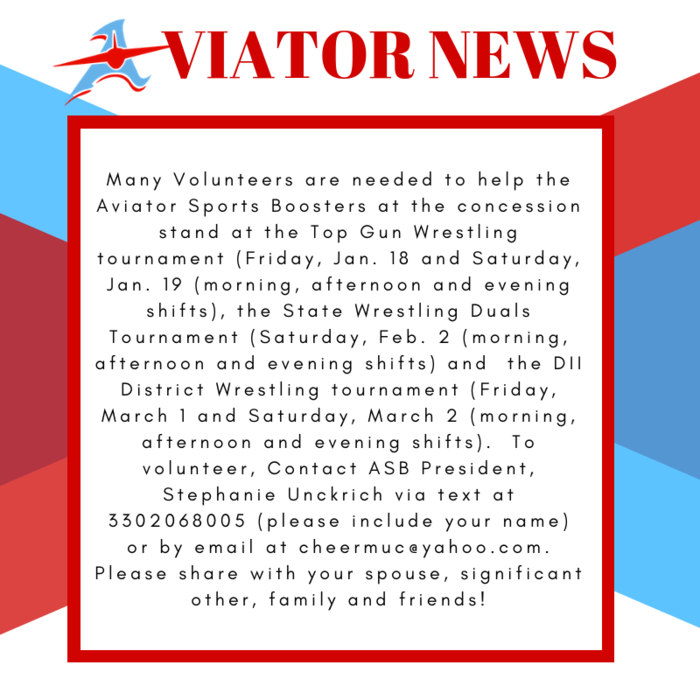 Meetings are open to all Aviator fans! Please come & get involved! 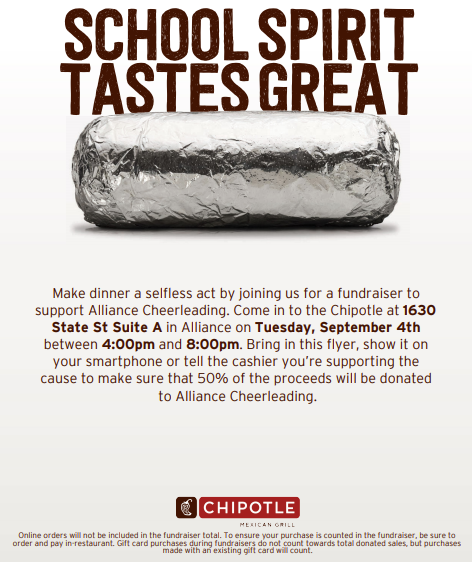 Get dinner today at Chipotle - show this flyer tonight 4pm-8pm and 50% of the proceeds will go to the Cheer Team. Yesterday's Soccer game vs. West Branch that was cancelled will be made up on 10/8 @ 7pm @ Alliance. The Alliance vs West Branch Girls Soccer match has was cancelled for tonight. The makeup date will be announced. Go Aviators! Due to inclement weather our 7th/8th grade Football teams will travel back to Canfield tomorrow for a 4pm start to finish the 2nd half of the 7th grade game and the 8th grade game. The 9th grade game will not start until approximately 7:15pm. 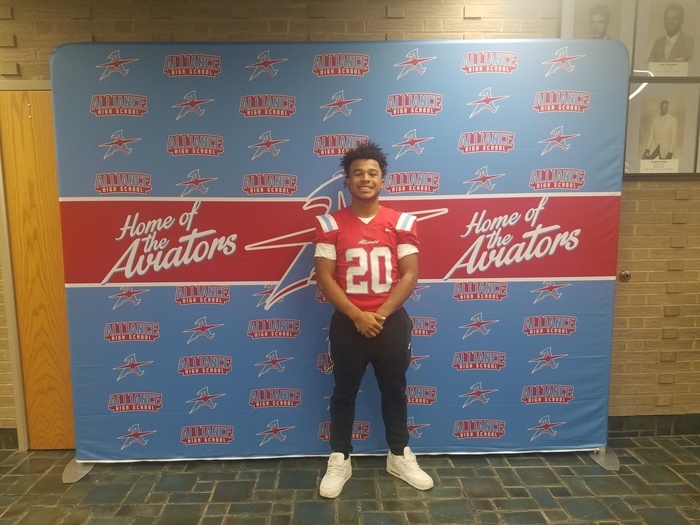 Go Aviators! 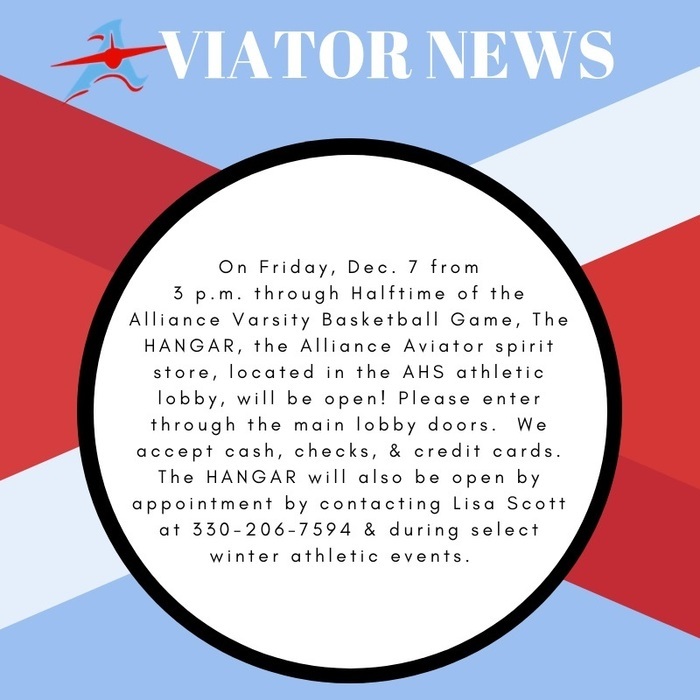 THE HANGAR, the Alliance Aviator spirit store located in the AHS athletic office, will be open Wednesday, August 29th from 4-7:30pm. Please enter from the main lobby doors. In addition, The HANGAR will open by appt. by contacting Lisa Scott at 330-206-7594. The replacement for the 7th grade football game @ West Branch that was cancelled will be: 9/12 - at Southeast with kickoff at 4pm. The Girls Golf match Alliance @ Salem, originally scheduled for 8/28, has been moved to 9/5. 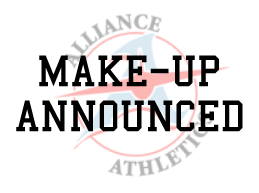 The Boys Soccer makeup with Ravenna at Alliance that was scheduled for 9/1 has been rescheduled for 9/22 at 7pm. If you plan on playing a winter or spring sport make sure you get all paperwork completed and e-signed at alliance-oh.finalforms.com and turn your physical in to the athletic office! Call 330.821.3972 with questions! The boys soccer game for this Saturday vs. Waterloo will now be AT Waterloo at 7pm. The 7th grade football game @ West Branch on 9/11 has been cancelled. Any replacement is TBD. Today's AMS golf match vs. West Branch has been cancelled. Any make up is TBD. The girls golf match against Marlington at Sleepy Hollow scheduled for 8/23 has been moved to 9/17. 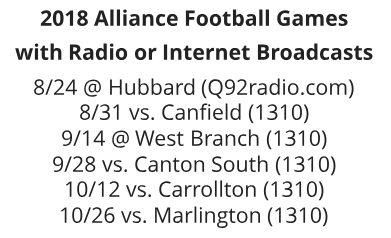 Six Varsity football games will be broadcast on the radio or via an internet broadcast this fall. Check out the image for more information if you can't make it in person! 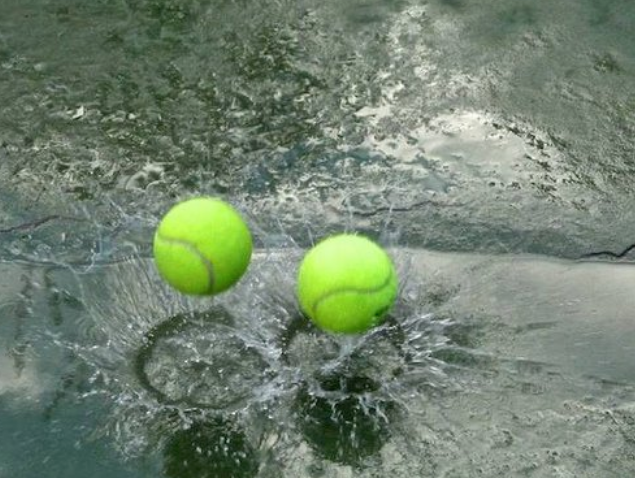 Yesterday's tennis match with Marlington was cancelled and moved to 8/27 @ 4pm @ Silver Park. The tennis match at Salem on 8/28 has been cancelled with a TBD makeup. On 10/25 our Freshman Football team will be going to West Holmes HS instead of Archbishop Hoban. AMS Golf at Carrollton moved from 8/14 to 8/16 at 1pm. Yesterday's tennis match was cancelled and has been moved to tomorrow, 8/15 at 4pm. Thursday's tennis match vs. Orrville has been moved up to 11am. The tennis match on 8/23 vs. Marlington has been moved to this Friday, 8/17 at 10am. The ticket office will be open tomorrow, Monday 8/6 from 5pm-6:45pm for anyone wanting to purchase football season tickets or sport passes. 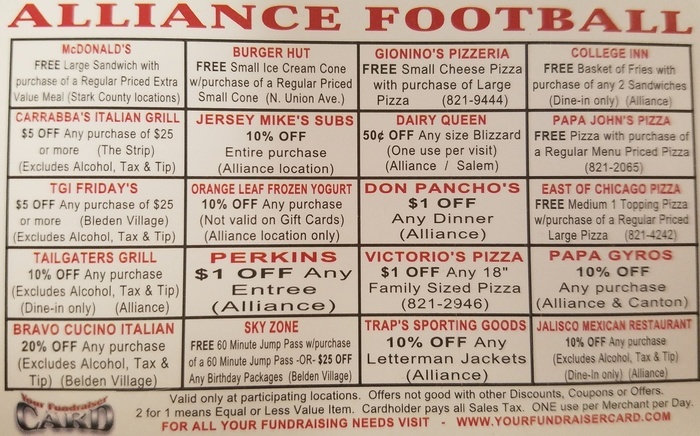 If you missed getting a Football Discount Card please stop by the AHS Athletic Office to pick one up. Cost is $10. Like Rigatoni? 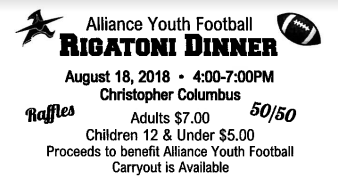 Want to support Alliance Youth Football? See image for details. Stop by the AHS Athletic Office to purchase tickets! Congratulations to Char Cannon who won the Hall of Fame Raffle! Don't forget to get your paperwork and physical done before fall practices start so you can practice with your team. These Review Athlete of the Week plaques were just dropped off - stop by the athletic office 8a-4p today, or next Tues-Thurs to get them. Also - THANK YOU to Jodi Handy and her Alliance Career Center Medical Assistant students for all of their help with free physical day! THANK YOU to the health care professionals who earlier this month provided 375 AMS & AHS students with a free sports physical for next year! 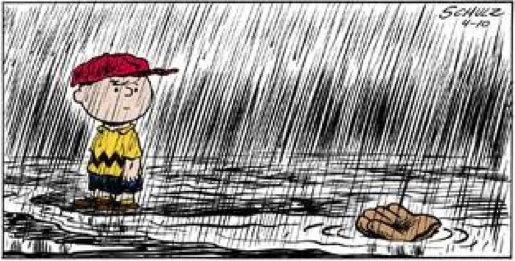 JV Baseball's trip to Green tomorrow, Wednesday, May 16th has been cancelled. The Varsity baseball game vs. Minerva will be made up this Friday, May 18th at 5pm at AHS. The JV and Varsity Baseball games against Minerva for tomorrow (5/15) have been cancelled. 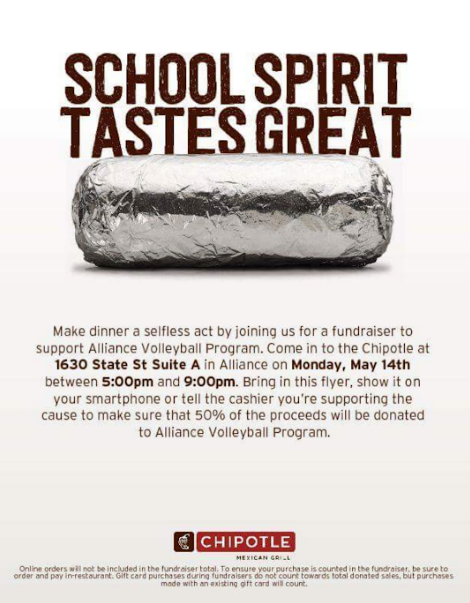 Buy Chipotle tonight from 5pm-9pm and show this flyer to the cashier to support the Volleyball program. Online orders do not count. Final ASB meeting for the 2017-18 year is tonight, Monday, May 14th @ 7pm. Election of 2018-19 officers. 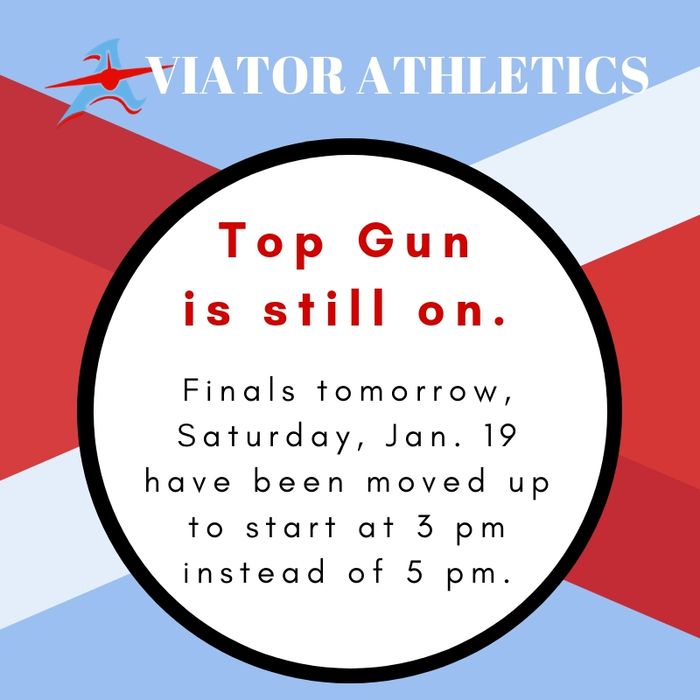 All Aviator fans are encouraged to attend! The JV Baseball game at Boardman for tonight has been cancelled. Congrats to Tyler Johns and Kylee Young for being named the 2017-2018 AHS Athletes of the Year earlier this morning! 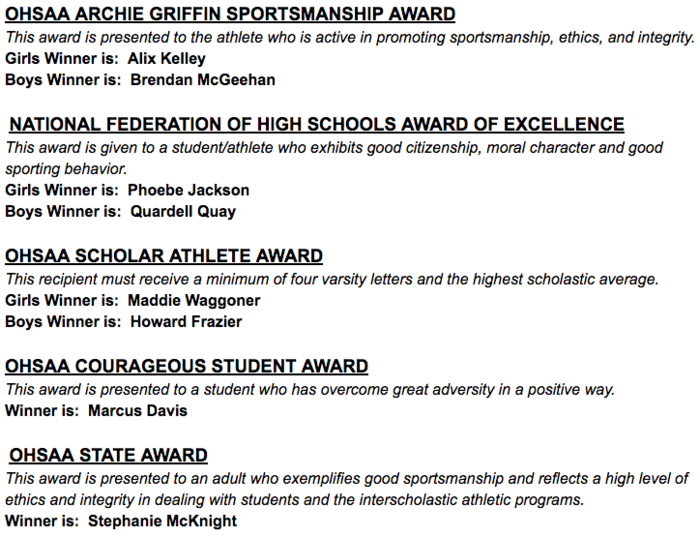 Congratulations to the following people who received OHSAA/NFHS awards earlier this morning. Softball post-season play begins Thursday vs. Niles McKinley at AHS at 5pm. Entire district bracket can be found here. Baseball post-season play starts tonight vs. Salem at 5pm. Entire district bracket can be found here. The Varsity Softball game vs. Canton South has been moved from May 14th to the 15th, still 5pm, still at AHS. The boys' tennis match vs. McKinley will be made up at Silver Park at 4pm on Wednesday, 5/9. The JV softball game for tonight has been cancelled. The AHS track meet at Marlington on May 8th has been moved up to 4pm. Parents!! 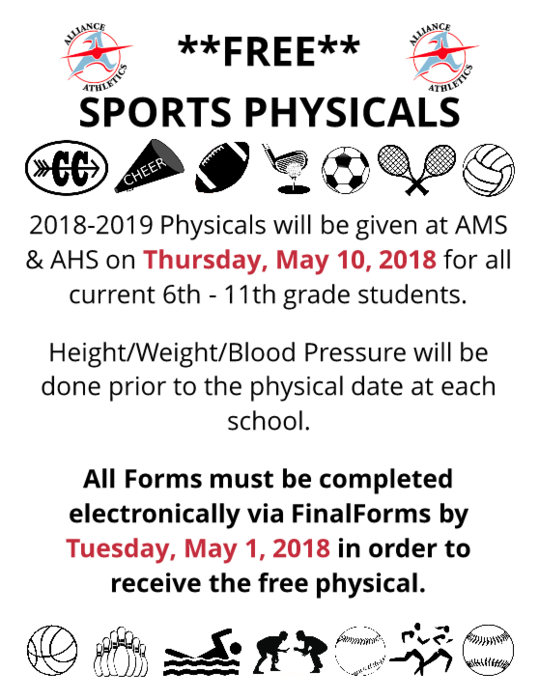 Tomorrow, 5/1 is the last day to finish signing/submitting all of your athletes' forms to get a free physical at school. 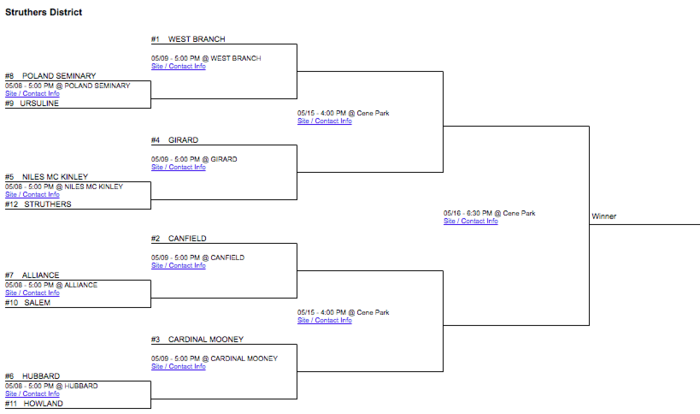 Boys Tennis has added a match vs. GlenOak for tomorrow, Tuesday, May 1st at 4pm at Silver Park. The JV Baseball game at Austintown Fitch this Saturday, 4/28 has been moved up to 11am. It will still be a single game. Tennis at St. Thomas tonight has been cancelled. The Varsity and JV baseball games for today have been cancelled. Reminder: If you want a free physical good for 2018-19 the paperwork is due in one week to alliance-oh.finalforms.com! The Softball contests against Southeast for May 4th have been cancelled. The Softball teams will now each play a doubleheader against Salem on Saturday, 4/28 beginning at 10am. Varsity at AHS, JV at Early's Hill. The Tennis match today at Salem will now be at the Salem Racquet Club. Start time is still 4pm. Baseball against Carrollton today has been cancelled and will be made-up on 4/30. JV and Varsity Softball at Salem today has been cancelled. The Varsity Softball game vs. St. Thomas Aquinas for this Friday, April 27th has been cancelled. Due to the sectional tournament the baseball schedule with Canton South has changed. See image for details. A JV Softball game has been added to Monday, April 23rd vs. Ursuline at 5pm. It will be at AHS. The Varsity Softball game at St. Thomas for tomorrow has been cancelled and will instead be a home game vs. Minerva at 4:30pm. Tennis tonight vs. Canton South has moved to the Salem Racquet Club. Their match will still begin at 4pm. Baseball and Softball games for today are cancelled. Make-ups are TBD. Upcoming Baseball, Softball & Track Changes - check image for all the details! 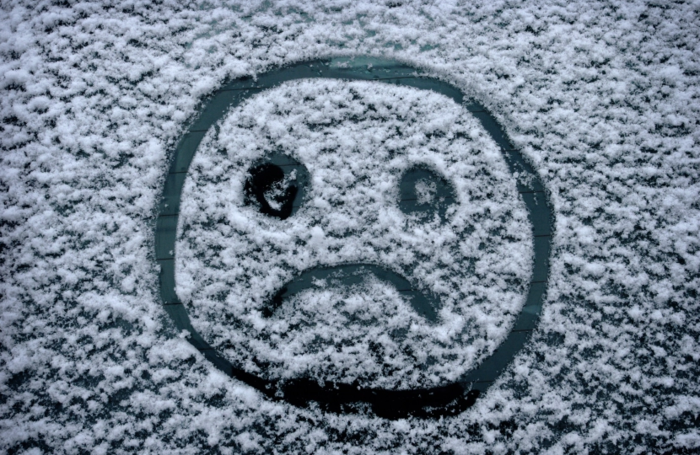 Tennis tonight has been cancelled due to a scheduling conflict. Make-up is TBD. 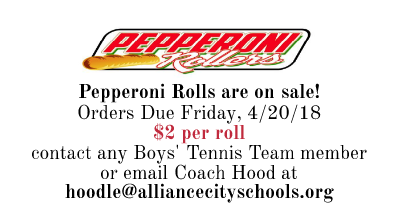 The Boys' Tennis Team is selling Pepperoni Rolls for $2 each. 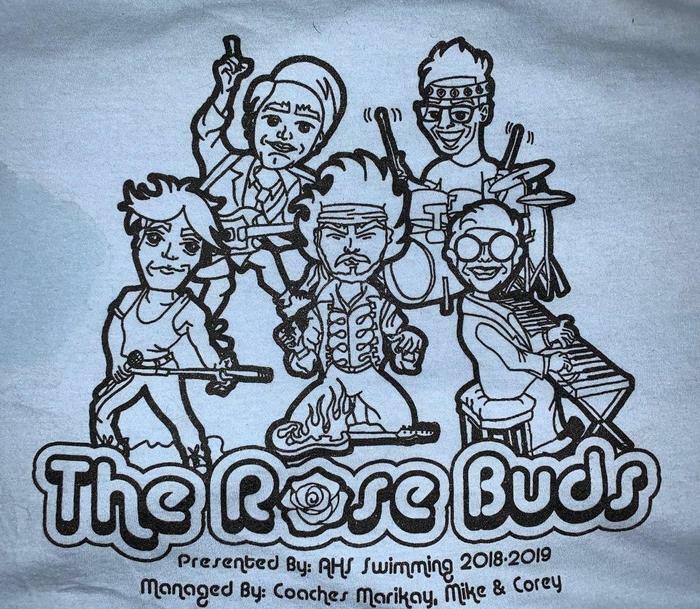 Orders are due by Friday, 4/20. The Varsity Softball game at St. Thomas this Friday, 4/20 will now start at 4:30pm. The home AMS track meet vs. Carrollton on Wed, 4/25 has been cancelled since Carrollton will also be running at Louisville on Mon, 4/23. 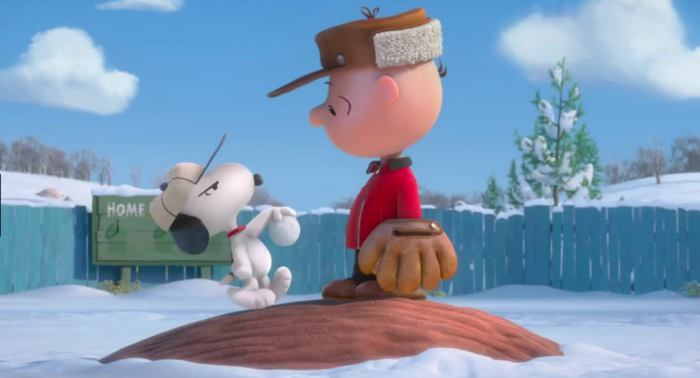 4/18 JV Sball vs. United is cancelled. 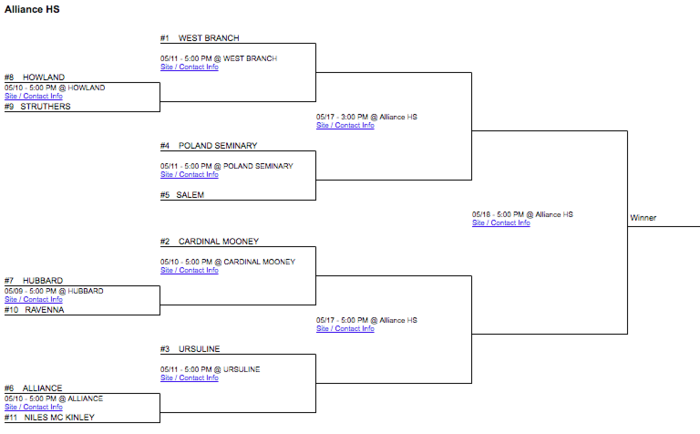 4/20 JV Bball will go to Salem instead of Waterloo. Varsity Bball will be home vs. Salem. Both 5pm. Boys Tennis at Marlington for today has been cancelled and moved to this Friday, 4/20 with a 3:30pm start. Surprise! - Baseball and Softball games for today are cancelled. We'll try again tomorrow. Make-ups are TBD. The Varsity Track Meet for tonight vs. Salem is cancelled. Make-up is TBD. 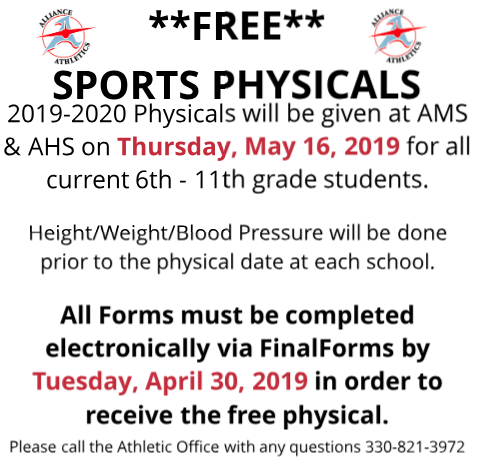 If you have any questions about FinalForms or the free physicals please call the Athletic Office at 330-821-3972. Save yourself a trip to the doctor and have it done at school and be ready for next year before summer break even starts! If you don't want a free physical you still must complete all paperwork online, then print out the form to take to the doctor to get signed. 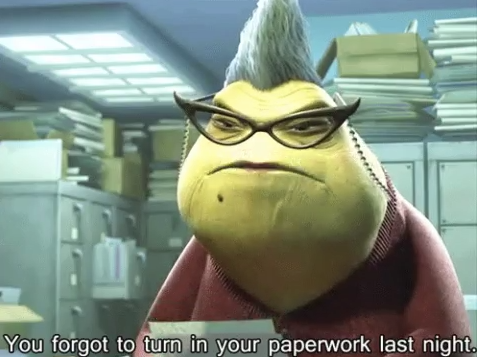 2 weeks left to get 2018-19 paperwork completed for a free physical-> alliance-oh.finalforms.com Don't be Mike Wazowski and forget! The tennis match for tonight vs. Hiland has been cancelled. It will be made up May 2nd, still at Alliance. The Varsity Softball make-up with Canton South has been scheduled for Monday, April 23rd at 5pm. It will be at Canton South. AMS Track teams will be going to the Salem Invite this Friday, 4/20. See image for important information. There is an admission fee! There will be a player&parent info meeting on 4/26 at 6pm at the Rockhill Field House for any boys interested in playing high school soccer. The AMS track meet at Louisville for today has been cancelled and will be made up on 4/23. The Varsity & JV Baseball games against Salem today have been cancelled. Make-ups are TBD. 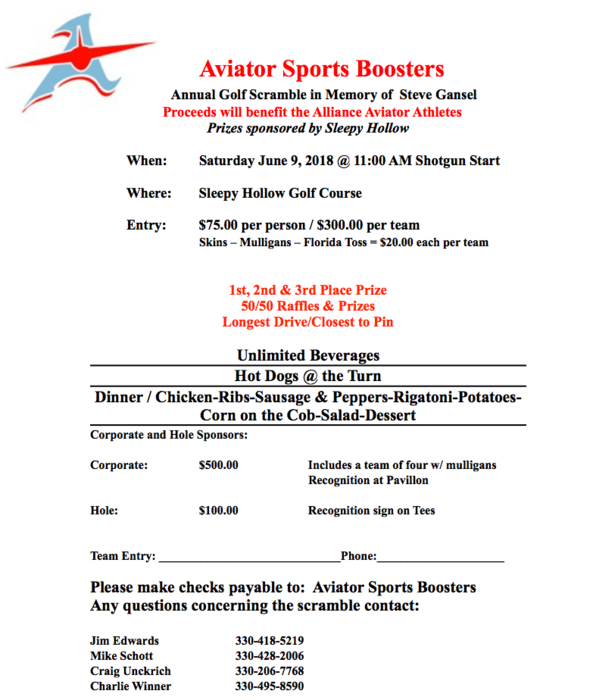 The Annual Aviator Sports Booster golf outing will be June 9th. Contact Mike Schott if you are interested in playing and/or sponsoring! ADDITION: The tennis team will be traveling to Dover today for a match at 4:30pm. 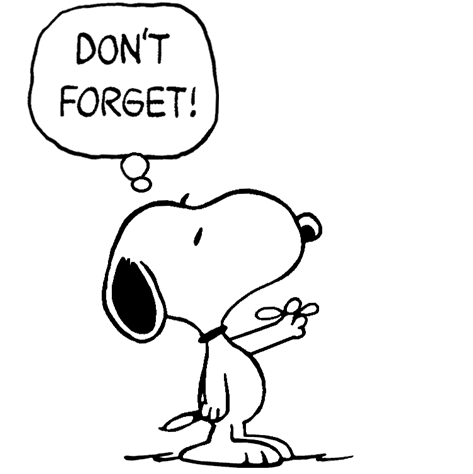 DON'T FORGET!!!! 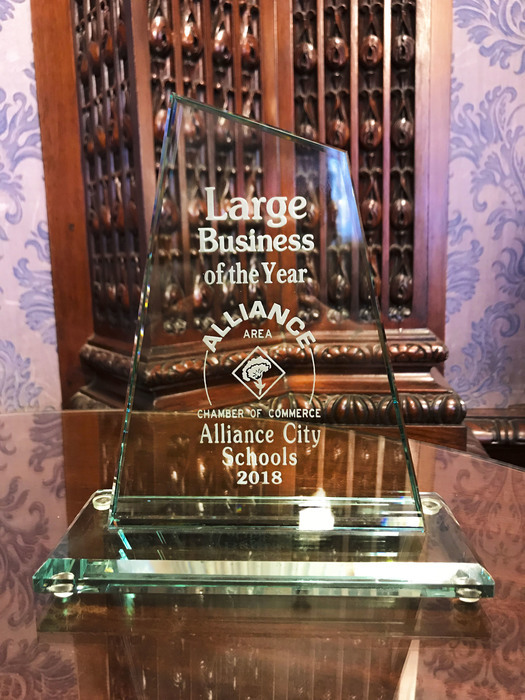 All 2018-19 paperwork must be done online at alliance-oh.finalforms.com - Do by 5/1 & get a free physical on 5/10. The Softball games against Southeast have been moved from 5/7 to 5/4. Still 5pm. JV home, Varsity at Southeast. Next Thursday's (4/19) Varsity Softball game vs. Minerva will start at 4:30pm instead of 5pm. CHANGE: The Varsity Baseball team will now be playing a doubleheader with Columbiana Crestview on Saturday, 4/14 starting at 10am. ADDITION: Varsity baseball game TODAY at Niles McKinley at 5pm. 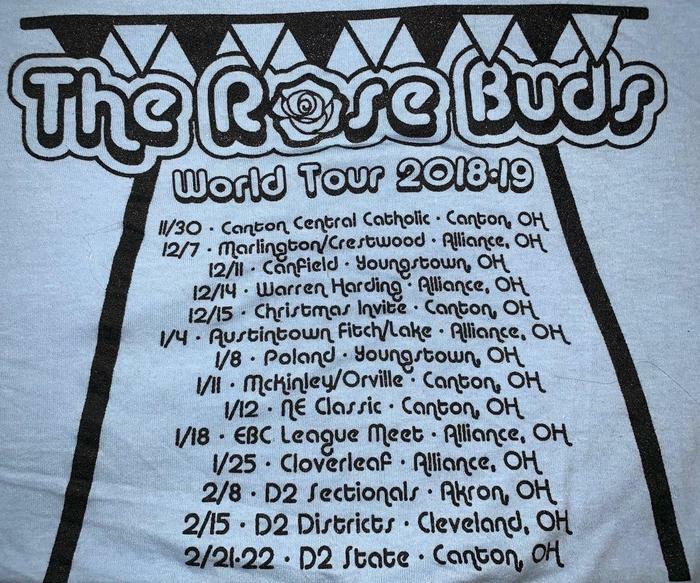 They will play at Niles City Field at 1 McRoberts Rd SE, Niles, OH 44446. The JV baseball game vs. Boardman for Fri, 4/13 has been cancelled. JV Softball Changes TOMORROW, 4/11 - JV Softball will now play at AHS vs. Northwest. The game will still be at 5pm. JV Softball Changes TODAY, 4/10 - JV Softball will now play at AHS vs. Carrollton. The game will not start till around 5:45pm. The Varsity baseball team will play this Saturday, 4/14 at 11am vs. Columbiana Crestview at AHS. The Varsity Softball and Baseball games for tonight have been cancelled. Make-ups are TBD. The JV & Varsity softball contests against Salem will be made up at 10am on Saturday, April 28th in Alliance. 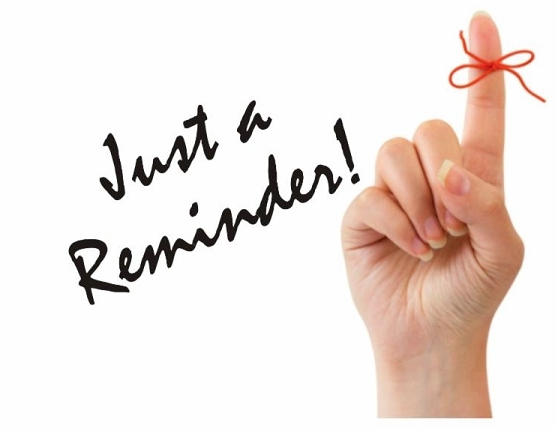 Reminder all 2018-19 paperwork must be done online via FinalForms. Students with paperwork done by 5/1 will receive a free physical on 5/10. MAKE-UP ANNOUNCED: The JV and Varsity softball teams will be going to Louisville on Friday, April 13th at 5pm. Correction: the softball make-up tomorrow will only be Varsity as Canton South does not have a JV team. Both the Varsity and JV softball doubleheaders for tomorrow have been cancelled. All events are continuing as scheduled tonight. Dress warm! The baseball games against Southeast for tomorrow, 4/7 have been cancelled. JV Softball will play Marlington tomorrow, Friday, 4/6 at 5pm at AHS. JV Baseball & Softball games for today have been cancelled. 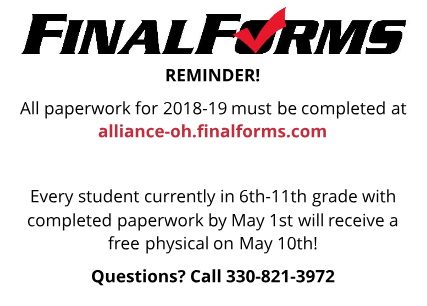 Reminder: All 2018-19 Paperwork must be done via https://alliance-oh.finalforms.com - Get yours done before 5/1 for a free physical on 5/10! Today's MS Track Dual Meet @ Louisville is cancelled. It will be made up on 4/16 when the team is already at Louisville for a quad. The tennis match cancelled today will be made-up this Friday 4/6 @ 4pm. It will still be at Canton South. Today's track meet vs. Louisville has been cancelled. The meet will be made up this Thursday, 4/5 @ 4:30pm at AHS. Today's softball games at Louisville have been cancelled. Make-ups are TBD. Today's tennis match and baseball games have been cancelled. Make-ups are TBD. 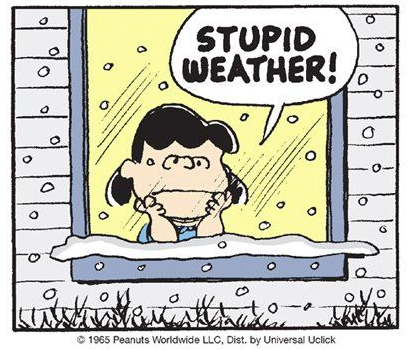 The Varsity Softball game scheduled for today at Minerva has been cancelled. Makeup is TBD. The JV and Varsity baseball games against Cardinal Local scheduled for today have been cancelled. Today's Varsity Baseball game at Massillon has been cancelled. A make-up date is TBD. Today's JV & Varsity Softball games vs. Salem have been cancelled. Make-up dates are TBD. NEW TIME & LOCATION: Today's tennis match vs. Kidron Central Christian has been moved to 2pm at the Salem Racquet Club. DATE CHANGE: The May 10th softball game at Canton South has been moved to April 4th. It will still be at Canton South at 5pm. 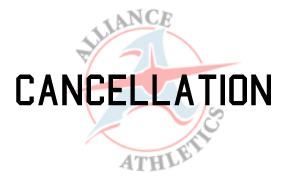 The Alliance/West Branch High School track meet that was cancelled yesterday will be made up on May 3rd at 4:30pm at Alliance. The Tennis match tomorrow (3/29) vs. Kidron Central Christian has been moved up to 2:30pm. The match will still be at Silver Park. 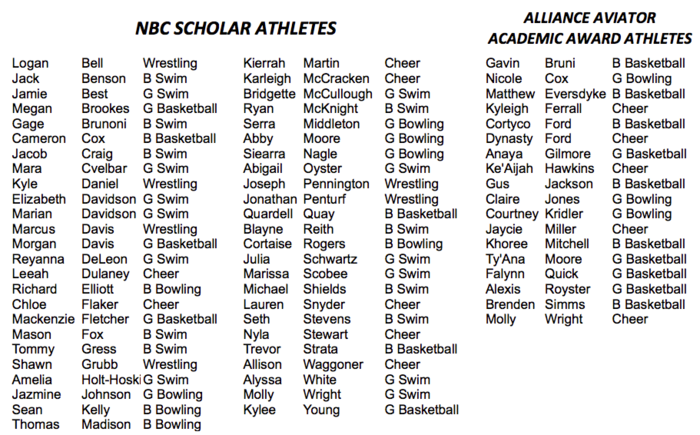 Winter Academic Award winners (NBC Scholar Athletes and Alliance Aviator Academic Award winners) listing can be found here. Reminder: Winter Sports Awards night is tomorrow, at 6:30pm at AHS. All academic award winners should report at 6pm for pictures. Correction: indoor track conditioning will be on Mondays, Wednesdays and Thursdays. Indoor track conditioning starts this week after school @ 2:45. Meet in the lobby after school. Conditioning will be Mon/Wed/Fri. 1/8/18 - Tonight's MS & 9th grade basketball games have been cancelled. Makeup dates TBD. 1/4/18 - Tonight's MS basketball games against Salem have been cancelled. Makeup date TBD. Reminder: JV/Var Boys Bball game vs Marlington on 12/29/17 will start at 5pm/6:30pm. Our first high school girls basketball game without JV is tomorrow night, 11/30. Varsity will play Sebring at 6:30pm. Boys Varsity Basketball @ Garaway (12/1) will be televised. See image for more information! Click on the image for more information about this weekend's football game. Here are driving directions for tonight's soccer game! The Cleveland-Massillon Rd. exit to Norton off of I-76 is closed due to construction. Alternate route -- Take 1-76 West towards Barberton. After the I-277 split, be sure to get in the middle lane for Barberton/Norton/ Cleveland-Massillon Rd. Take the Barber road exit. Turn right and follow towards Barberton HS. At Barberton HS, turn right on Norton Rd. Follow for 1.5 miles. Turn right on Cleveland-Massiillon Rd. Follow for .25 miles. Pass Grace Church of Norton and turn left at the entrance to new Norton HS (Panther Way). Tomorrow morning's JV football game against Carrollton has been canceled. Little Aviator Youth Sports Volleyball for Grades 1-6 is 5-6 PM (not 6-7 PM as stated in chalkboard chatter) andcwill be held every Wednesday at the high school. Girls tennis will practice at 3:00. Girls tennis vs. Hiland has been canceled for tonight. This Thursday's 9th grade Football game vs Marlington has been cancelled. Good luck to the varsity football team as they travel to Canfield tonight at 7:00. Go Aviators! Tickets for freshman football games are $2 for students and $5 for adults. Today's Girls Golf match at Massillon has been cancelled and will be scheduled at a later date. 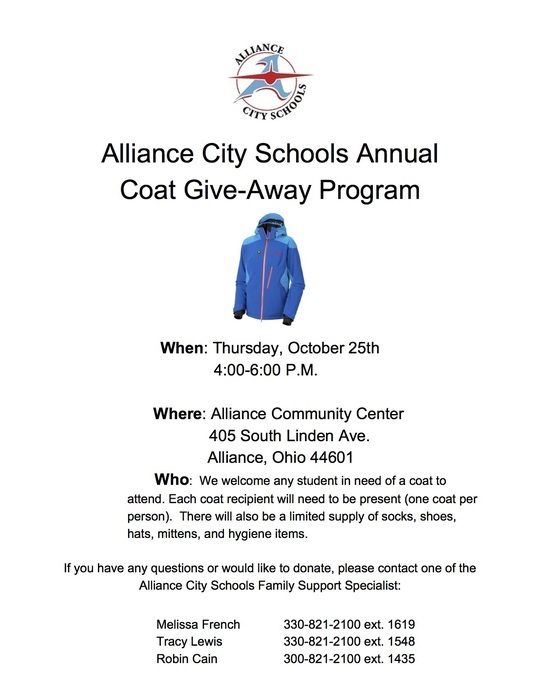 THE ALLIANCE MIDDLE SCHOOL FOOTBALL TEAM WILL HAVE EQUIPMENT HANDOUT AT THE ALLIANCE MIDDLE SCHOOL FOOTBALL FIELD AND LOCKER ROOM AT 5PM ON MONDAY JULY 31. A PARENT MEETING WILL FOLLOW AT 5:30. ANYONE INTERESTED IN PLAYING FOOTBALL SHOULD ATTEND. MANDATORY FOOTBALL PRACTICE WILL BEGIN ON AUGUST 1ST AT 3PM AT THE ALLIANCE MIDDLE SCHOOL FOOTBALL FIELD. THE LOCKER ROOM WILL OPEN AT 2:30PM. ANY STUDENT AND/OR PARENT INVOLVED WITH MIDDLE SCHOOL FOOTBALL SHOULD SIGN UP FOR THE REMIND TEXT MESSAGING SERVICE BY TEXTING @amsfball TO THE NUMBER 81010. Good luck to the AHS baseball team as they take on West Branch at 5:00. 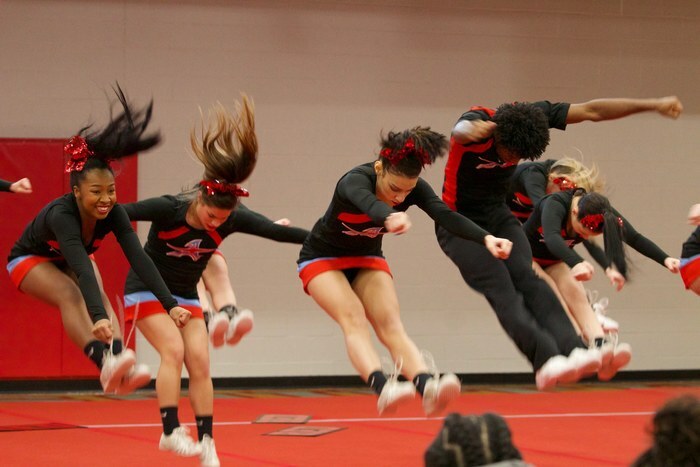 Go Aviators! 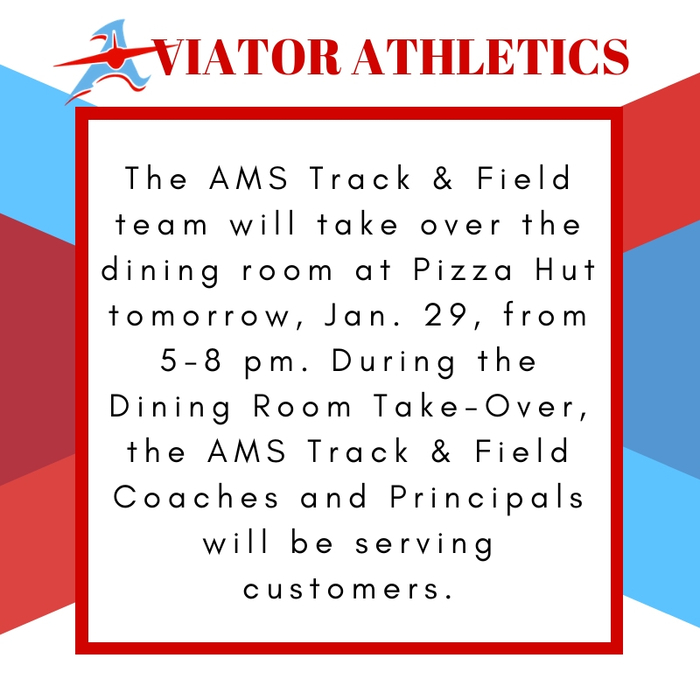 Tomrrow is the Track Banquet for the AMS Track Team. It will begin at 6pm at the Middle School. Good luck to the varsity baseball team as they take on Louisville at 5:00. Go Aviators! Good luck to the varsity baseball team as they take on Carrollton tonight at 5:00. Go Aviators! Good luck to the varsity baseball team as they take on Hoover at 5:00. Tonight is senior night. Good luck to the JV baseball team as they travel to West Branch for a doubleheader at 11:00. Go Aviators! 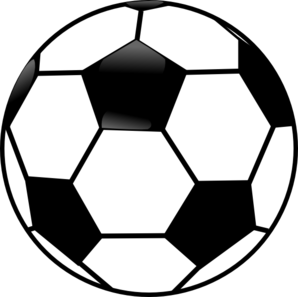 AMS Boy’s Soccer Meeting Any boy who will be attending Alliance Middle School next fall and is interested in playing soccer should attend a meeting being held Saturday May 20th at 6:00 PM at the locker room at Rockhill Field. This meeting is for boys currently attending the middle school as well as current fifth grade boys planning on playing soccer at the middle school this fall. Information regarding summer and fall soccer will be distributed. Both players and their parents are encouraged to attend. Questions regarding the meeting or boy’s soccer at the high school can be directed to AMS Head Coach Eric Eichner at 330-428-4554. 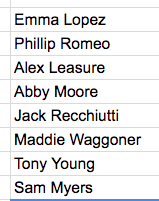 Good luck to all tennis team members competing in the NET tournament today! Go Aviators! Today's Varsity/JV Baseball Games vs West Branch have been cancelled. Due to excessive rain and parking the middle school NBC track meet tomorrow has been moved to Salem. JV and Varsity softball games have been canceled. JV Softball vs Canton South has been moved to Alliance HS today at 5:00 JV Baseball at Salem is cancelled for today. Sporting Events 4/14/2017 Good luck to the softball teams as they take on Salem tonight at 3:30. Go Aviators! Youth Track & Field Practices Anyone interested in learning how to throw the Shot Put or Discus will practice Monday and Wednesday from 4:30 - 5:30 at Rockhill Elementary school. Everyone else will practice at the Alliance High School Track on Wednesday from 4:00 to 5:30. There will be a Track Meet on Sunday, May 7 at Alliance High School, start time will be 12:00 noon. JV SB Practice @ 4:30pm Varsity SB Practice right after school. JV / Varsity Softball vs Salem has been cancelled today. 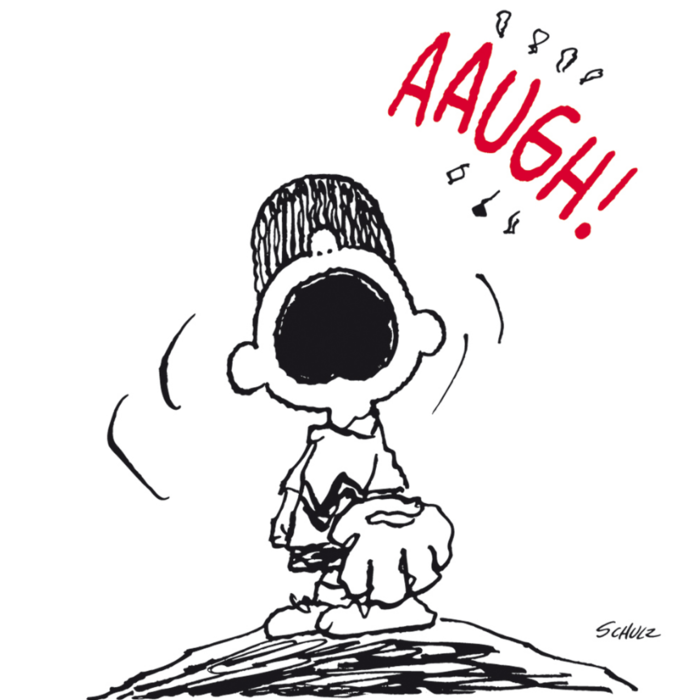 JV / Varsity Baseball vs Carrollton has been cancelled today. Support Our Sports: Good luck to the varsity baseball team as they take on Lisbon today at 11:00. The JV baseball team will travel to Lisbon at 11:00. Go Aviators! AMS track has been canceled for today. Good luck to the bowling team as they compete at state today. Go Aviators! Good luck to the wrestlers competing at state today. Go Aviators! Good luck to all wrestlers competing at state tonight. Go Aviators! Good luck to the boys basketball team as they take on Akron St. Vincent St. Mary tonight at 7:00. This game is at the Canton Fieldhouse. Go Aviators! Good luck to the boys basketball team as they take on Norton tonight in the OHSAA Sectional Final! Go Aviators! Good luck to the wrestlers competing at districts today. Go Aviators! 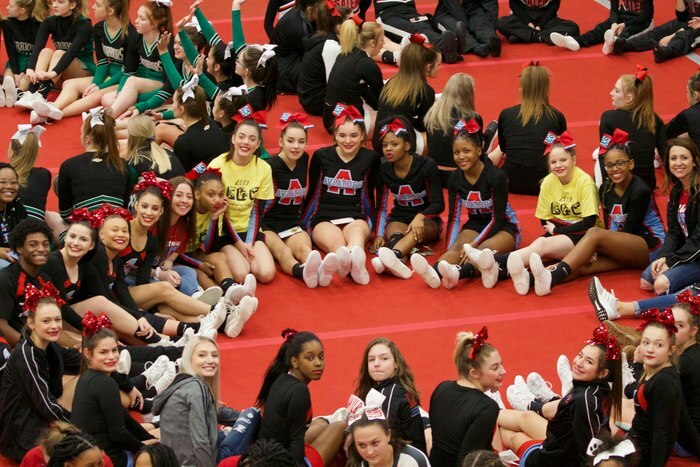 Good luck to the cheerleaders competing at state today. Go Aviators! Good luck to the wrestlers competing in the District Wrestling Tournament being held at AHS this weekend. Go Aviators! Good luck to the boys basketball team as they take on Marlington tonight in the sectional tournament at 7:00. Go Aviators! Conditioning for AMS track starts 3/1 and 3/2 from 2:30-4:15. A parent meeting on 3/2 will be held right after conditioning. Daily practice starts on Monday 3/6 at AHS from 2:45-4:15. Good luck to the wrestling team as they travek to West Branch today to compete in sectionals. Go Aviators! Good luck to the girls basketball team as they travel to Norton tonight for the sectional final at 7:00. Go Aviators! Good luck to Jared Watson and Will Rose tonight at the State Swim Meet. Go Aviators! Good luck to the AHS boys basketball team as they travel to Fitch tonight at 5:30. Go Aviators! Good luck to the AHS girls basketball team as they take on Sebring at 11:00. Go Aviators! Good luck to the AHS boys basketball team as they take on West Branch tonight at 6:00. Go Aviators! Good luck to the Varsity girls basketball team as they take on Tulsa at 7:30. Go Aviators! Good luck to all athletes today. Go Aviators! Varsity/JV wrestling at Massillon @ 8. AMS girls basketball @ Northwest @ 10. AMS wrestling @ Canfield @ 10. JV girls basketball vs Carrollton @ 12. AMS boys basketball @ Northwest @ 1. Varsity girls basketball vs Carrollton @ 1:30. Good luck to the AHS boys basketball team as they take on Minerva tonight at 6:00. Go Aviators! Good luck to the AHS boys basketball team as they travel to St. Thomas at 6:00. Go Aviators! Good luck to all athletes competing today. 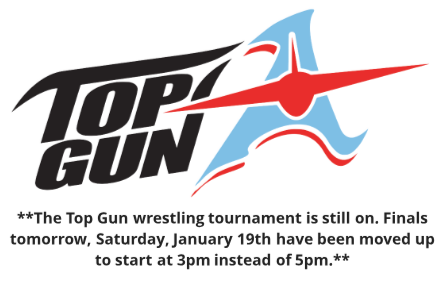 The Top gun wrestling tournament will continue at AHS. The AHS girls basketball team will travel to Canton South at 12:00. Go Aviators! Today's Boys Bowling Match vs Heritage Christian has been cancelled. Good luck to the AHS boys basketball team as they travel to West Branch. JV at 6:00 and Varsity at 7:00. Go Aviators! Good luck to the AHS boys basketball team as face Salem tonight at 6:00. Good luck to the AHS swim team as they face Marlington and Fitch at 5:00. It is Northside night at the basketball game. Good luck to the AHS bowling team as they travel to the Park centre tournament. Go Aviators! 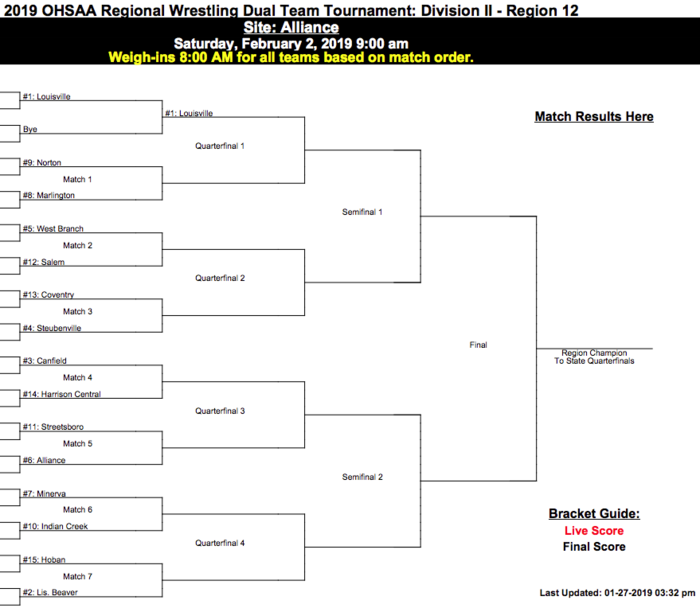 Good luck to the AHS wrestling team as they travel to Brecksville. Go Aviators! Good luck to the boys basketball team as they take on new Philadelphia today at 1:00 at Mount Union. Go Aviators! Good luck to the AHS boys basketball teams as they take on Louisville at 6:00. Go Aviators! Today's Girls Bowling Match vs St. Thomas has been cancelled. Boys and Girls will bowl tomorrow vs Central Catholic. Good luck to the AHS bowling team as they travel to Carrrollton tonight at 4:00. Go Aviators! The HANGAR will be open Friday, 12/23 5:30pm thru halftime of the varsity boys basketball game for your last minute holiday shopping. The HANGAR will also open by appointment by contacting Lisa Scott at 330-206-7594. AMS Boys and Girls basketball vs Carrollton has been postponed today due to school being canceled at Carrollton. A make up date will be announced once set. Good luck to the AMS wrestling team as they travel to Louisville tonight at 5:30. Good luck to the AHS wrestling team. They will travel to Louisville at 7:30. Go aviators! Good luck to the AHS boys basketball team as they travel to Canfield at 5:30. Go Aviators! Tomorrow's JV Boys Basketball game at Canfield starts at 5:30pm. Reminder: Tonights Varsity Girls Basketball Game at Sebring will start at 6pm and there is only a varsity game. Thank You! 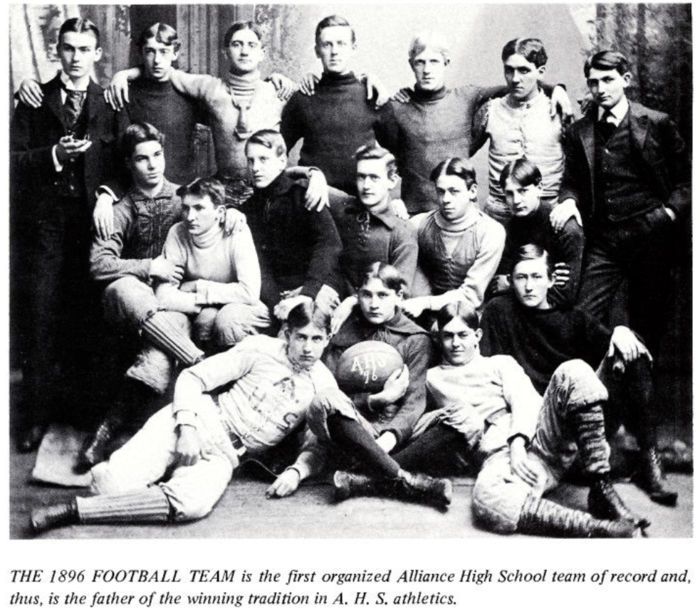 The Aviator Sports Boosters will meet Monday, November 7th at 7pm at AHS in room 237. 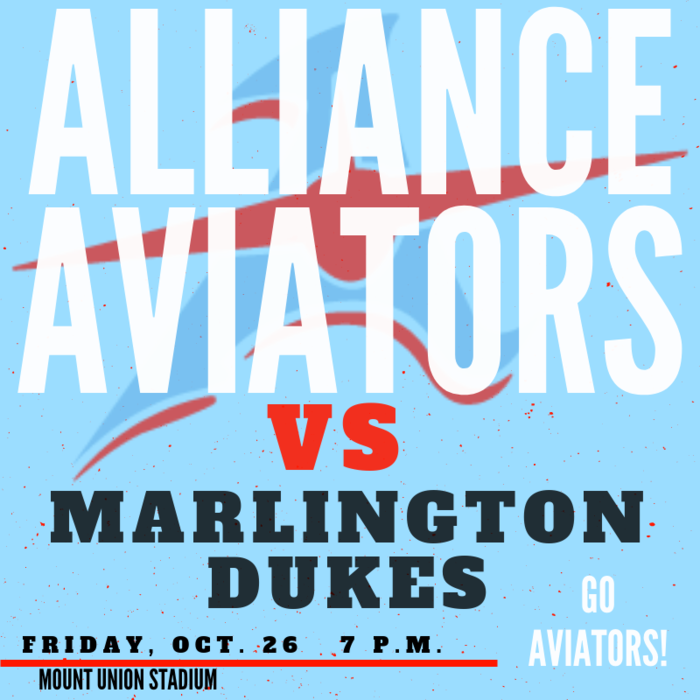 All Aviator fans are encouraged to attend! The HANGAR will also be open on Saturday, November 5th from 9AM-3PM during the AHS Craft Show. Good luck to those competing in the cross country regional tournament today! Good luck to the JV football team as they travel to Northwest at 12:00. Go Aviators! Good luck to the varsity football team as they take on Marlington tonight at 7:00. Go Aviators! 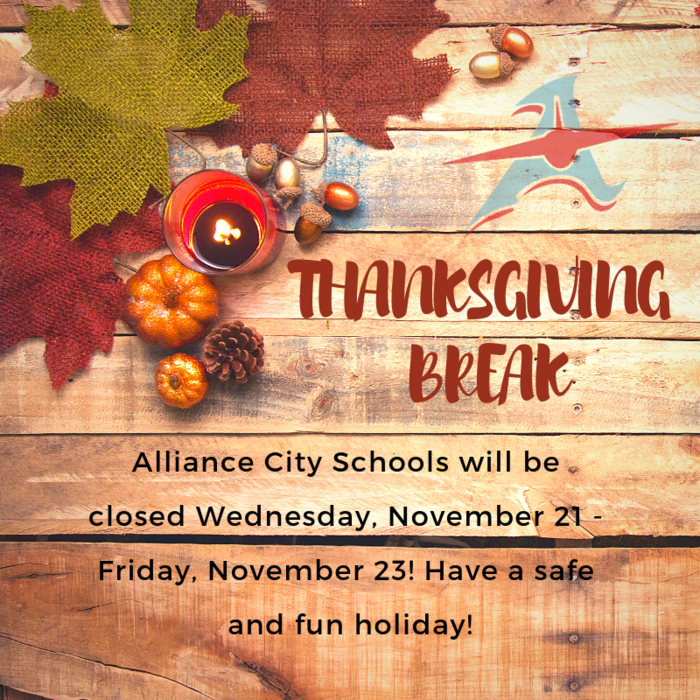 The HANGAR will be open Friday, October 28th from 2:30-5:30pm, please enter from the AHS main lobby doors. Good luck to the boys soccer team as they travel to Akron tonight for the sectional final. Game time is 7:00. Today's Boys Soccer match has been moved to Monday 10/24 at 7pm at Akron Springfield. Good luck to the varsity football team as they travel to Minerva tonight at 7:00. Go Aviators! The Aviator Sports Boosters still has 40+ squares for the World Series to sell! The board will be similar to that of the NCAA national championship & Super Bowl boards. Squares are $25 each. Payout is as follows: game 1 wins $100, game 2 wins $100, game 3 wins $100, if game 4 wins the series the winner wins $700, but if the series goes to game 5 the winner of game 4 wins $100, if game 5 wins the series the winner wins $600, but if the series goes to game 6 the winner of game 5 wins $100, if game 6 wins the series the winner wins $$500, but if the series goes to game 7 the winner of game 6 wins $100, if the series goes to game 7 the winner wins $400. Contact me, Craig Unckrich 330-206-7768, or Corey Unckrich 330-206-4396 to claim your square before they are sold out! Go Tribe!!! Good luck to the boys soccer team as they take on Canton South in the OHSAA tournament tonight at 7:00. Go Aviators! Football change! AMS 7th Grade Football team will play at 5pm today vs Salem at Southeast Elementary School in Salem. AMS 8th Grade Football will play tomorrow (Wednesday 10/12) at the same time and place. Good luck to all athletes competing today. Go Aviators! The AHS/AMS Ross country team will travel to Tuslaw today. The JV football team will travel to Carrollton at 10:00. Good luck to the varsity football team as they take on Carrollton tonight at 7:00. Go Aviators! Good luck to all athletes competing today. Go Aviators! JV volleyball will travel to Salem at 4:00. Varsity volleyball will travel to Salem at 5:00. Varsity boys soccer vs Canton McKinley at 6:00. Good luck to all athletes competing today. Go Aviators! 8th grade football vs Carrollton @ 5. 7th volleyball vs Salem @ 5. 8th volleyball vs Salem at 6. Girls varsity soccer vs Minerva @ 7. The Aviator Sports Boosters monthly meeting scheduled for tonight, Oct 3rd, has been postponed! Good luck to both varsity and jv football today as they take on West Branch at 10:00. The AMS/AHS cross country teams will travel to Glenoak. Go Aviators! Good luck to the varsity football team as they travel to West Branch tonight at 7:00. Go Aviators! Tonight's boys soccer match at Akron Ellet has been postponed until October 13th. Tonight's Varsity Girls Soccer game vs Salem will start @ 5pm with the JV to follow. Thursday's 9th grade football game against West Branch has been cancelled. Tonight's Girls Tennis Match at Marlington has been cancelled. AHS/AMS cross country will be at Malone today at 11:00. Good luck! Girls golf will be at the stark county tournament at Pleasant View at 9:90. Sporting events 9/24/2016: Boys golf will travel to the Stark County Invitational at 8:00. JV football vs Canton South at 10:00. Boys soccer vs East Palestine at 11:00. The AMS 7th & 8th Grade Football Games vs West Branch next week have been moved to separate days. The 7th grade will play at West Branch on the original date and time which is 9/27 starting at 5pm. The 8th grade game has been moved to Wednesday 9/28 starting at 5pm. Both games will take place at West Branch middle school. The Girls Golf Senior Night has been changed to this Wednesday at 3:15pm vs Beaver Local at Sleepy Hollow Golf Course. There is an admission charge of $5.00 for Adults and $2.00 for students for all Freshman football games home and away. Support Our Sports: Good luck to all athletes competing today. Go Aviators! AMS/AHS cross country will travel to Wooster. AHS girls soccer will travel Akron Springfield at 1:00. AHS boys varsity soccer will take on Coventry at 6:00. 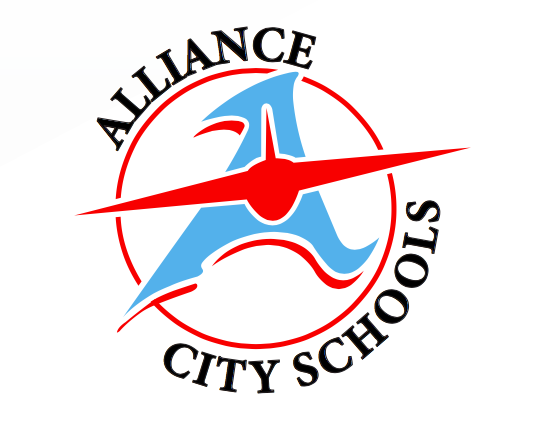 Follow live football scores on the Alliance City Schools app. 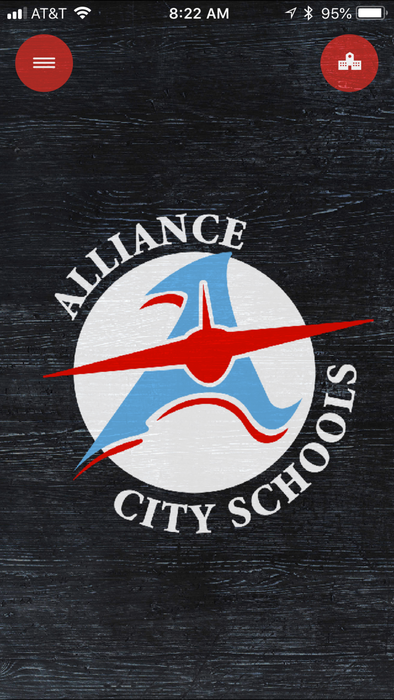 Search Alliance City Schools on your App Store! 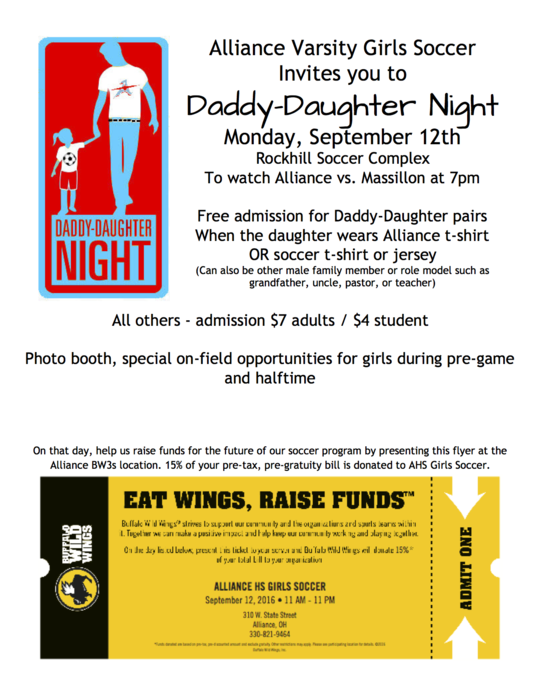 ​Varsity girls soccer invites you to Daddy-Daughter night. Click the flyer for more information. Good luck to the 7/8th golf team as they take on Carrollton today at 4:00. Go Aviators! Good luck to the varsity football team as they take on Canfield tonight at 7:00! Go Aviators!